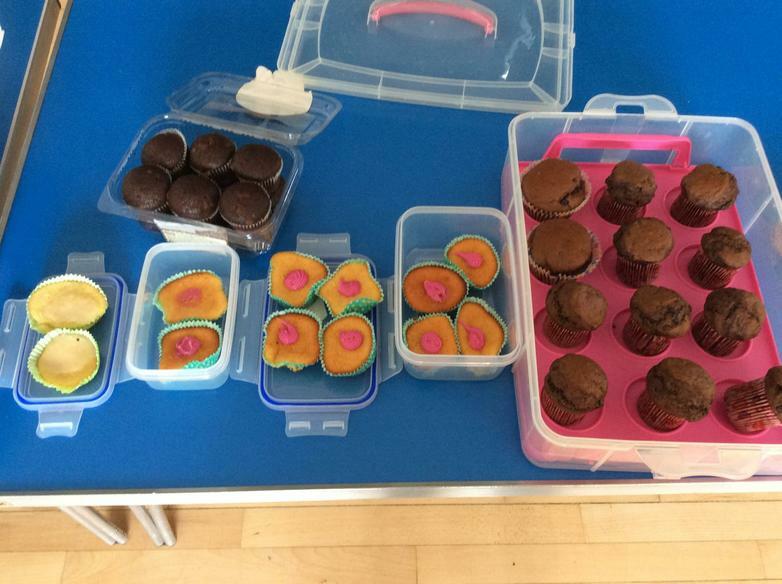 The Mini Vinnies have been very busy this week helping Miss Dunne with a couple of fundraising events. 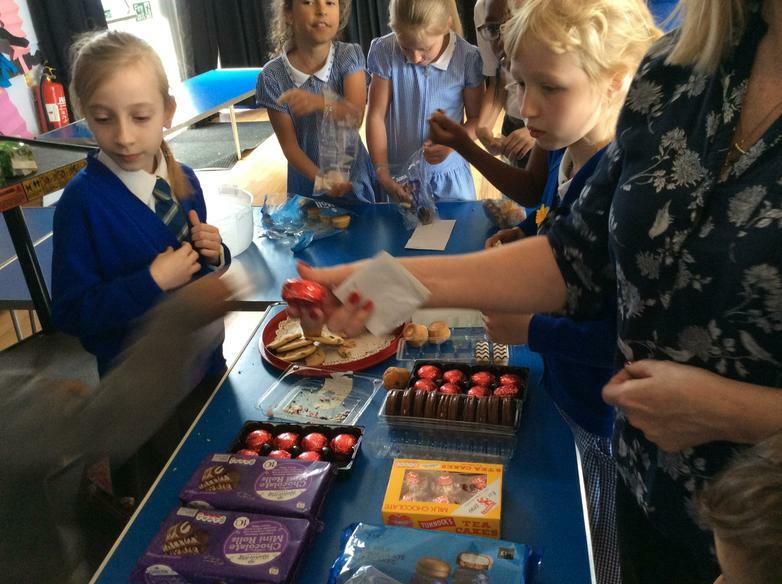 Firstly, they have been spending their break times on the playground raising money for the Marie Curie Great Daffodil Appeal. Many thanks to everyone who brought in £1 to buy a daffodil badge to support this cause which provides care and support for people with terminal illnesses and their families. 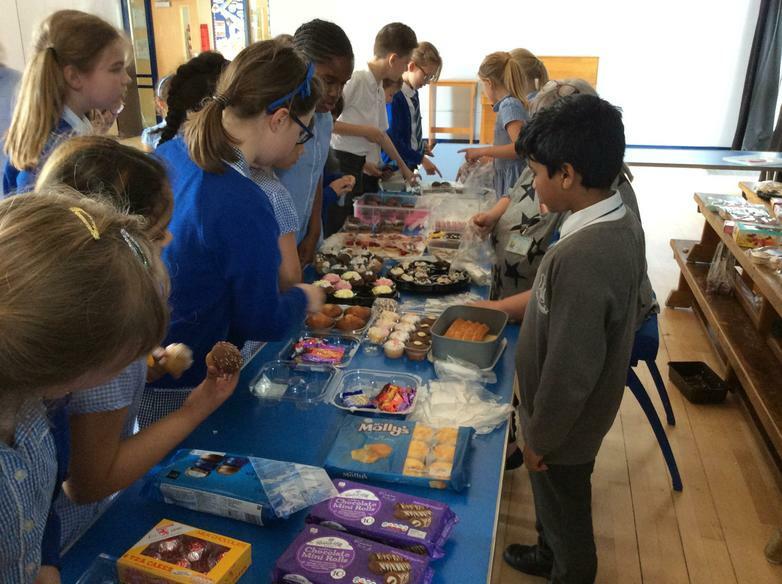 They also spent Thursday afternoon selling cakes to the children in their year group to help raise money for the Catholic Children's Society. 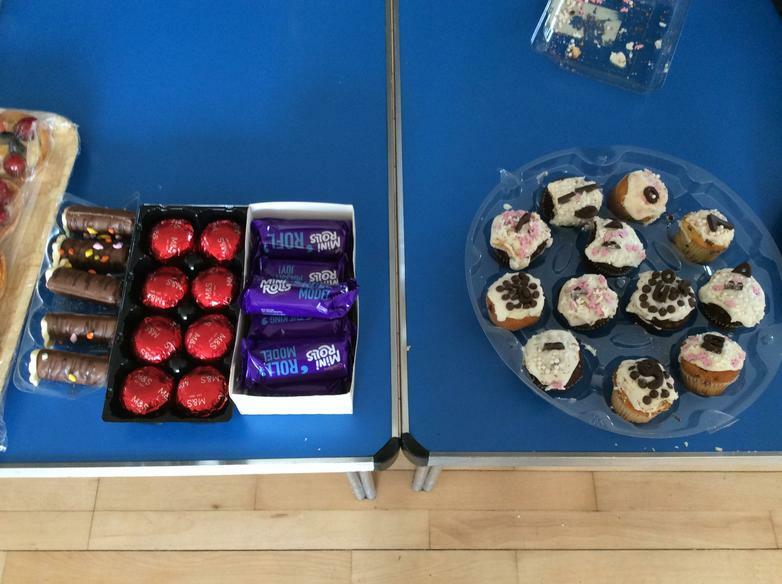 The cake sale raised an amazing £254.90 which will be added to the total amount raised through the Lenten appeal boxes that were sent home on Ash Wednesday. These boxes can now be returned to school. 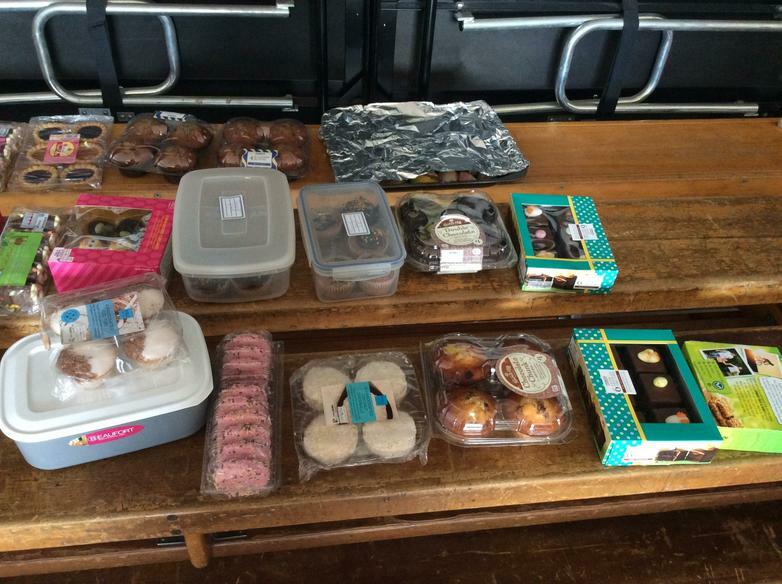 Thank you to everyone who donated cakes and bought cakes from the sale. 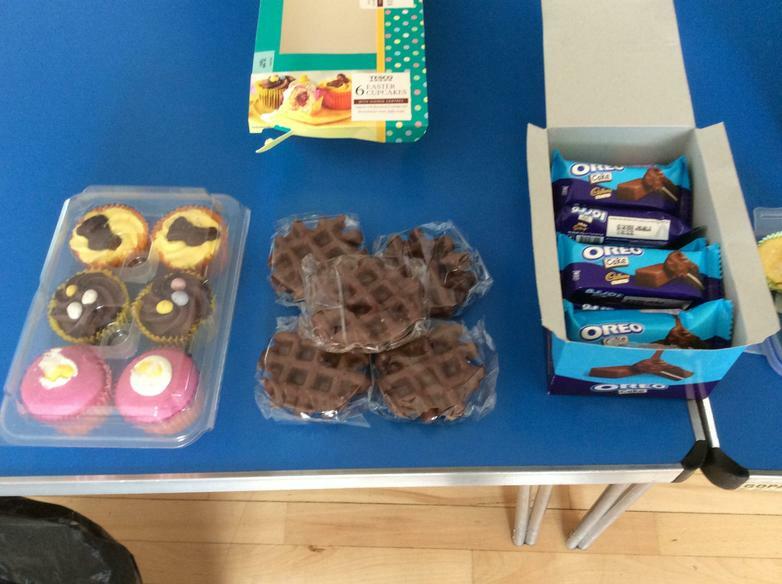 Also, a special thank you to Mrs O'Mullane for all of her help in the organising and running of the cake sale. 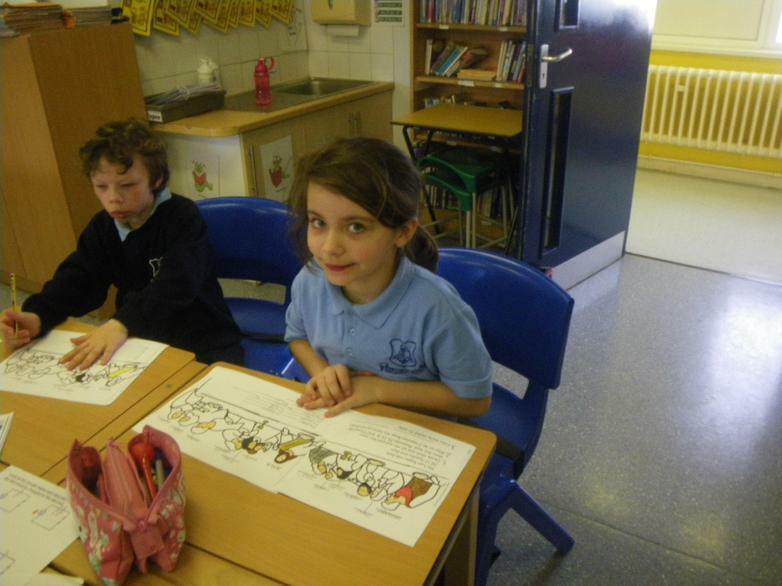 All of the children have had a session of Godly Play this week in Horizon House. 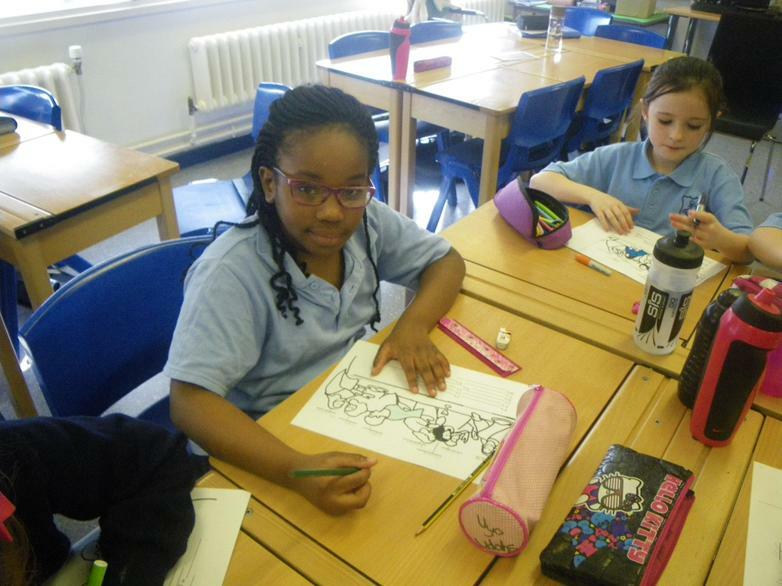 During their session, the children focused on the story of the Last Supper as part of their Lenten preparations. They were also able to clearly link this to our school theme of Adoremus. 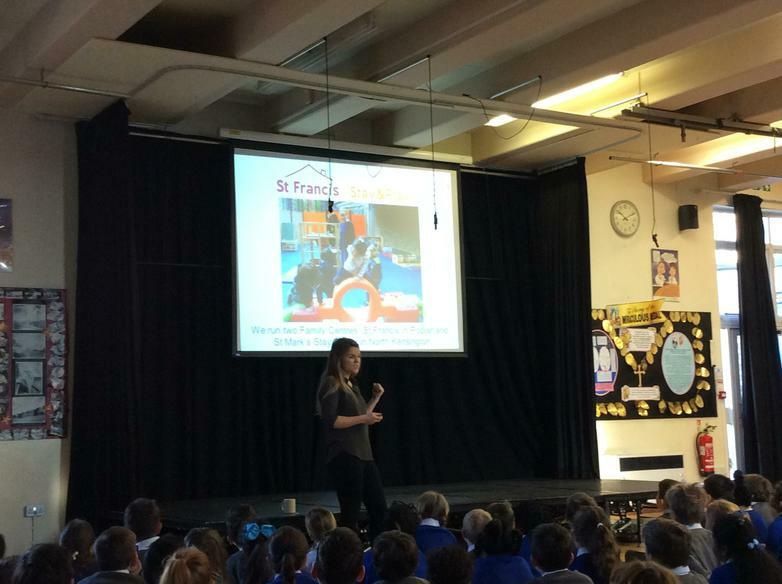 The children showed great knowledge of this story and its importance to us as Catholics. 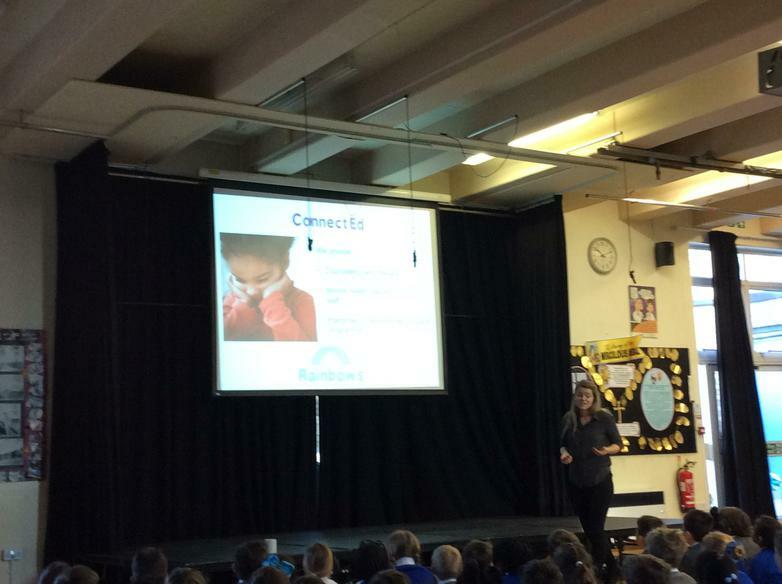 They all behaved very respectfully during their session and were able to give very meaningful answers. Well done. In the front entrance of the school you can now see the fantastic display that has been created by the children in Year 3 and 4 on our Adoremus theme. 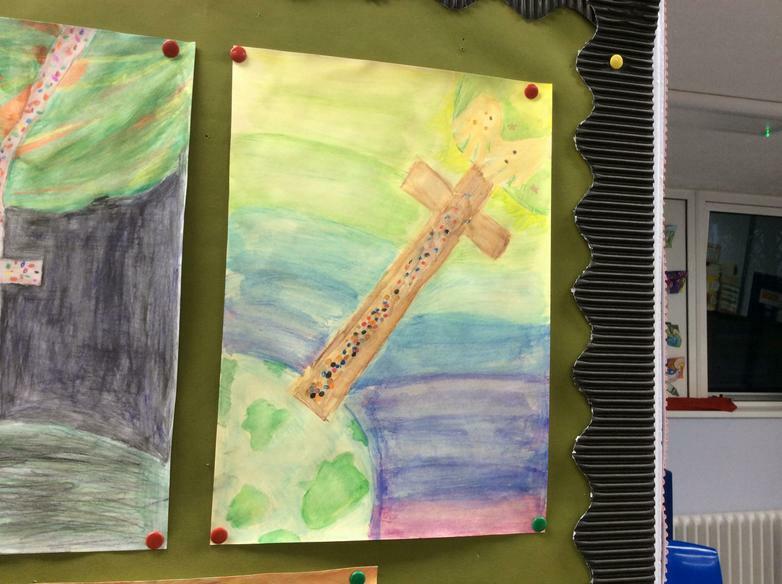 The children used the painting 'The Bridge' by Elizabeth Wang as inspiration for this display and created a piece of artwork showing that 'Christ is our Bridge to Heaven'. This was then finished by some fantastic prayers written by some of the Year 6 children. If you are in the office, please have a look and admire our beautiful new display! 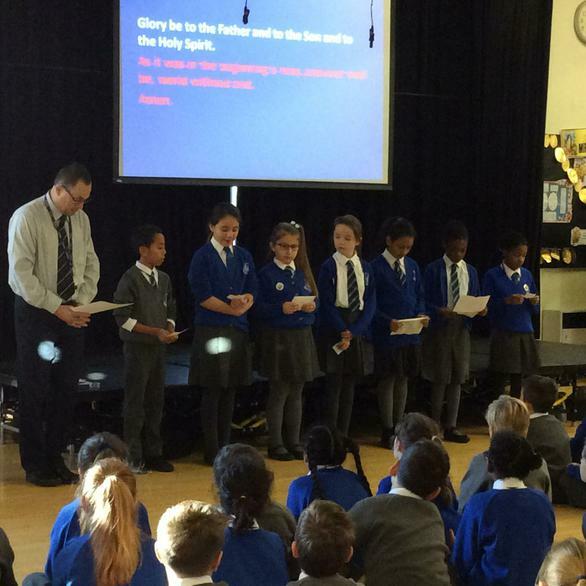 Each class held a special Ash Wednesday Liturgy in their classrooms today to mark the beginning of Lent. 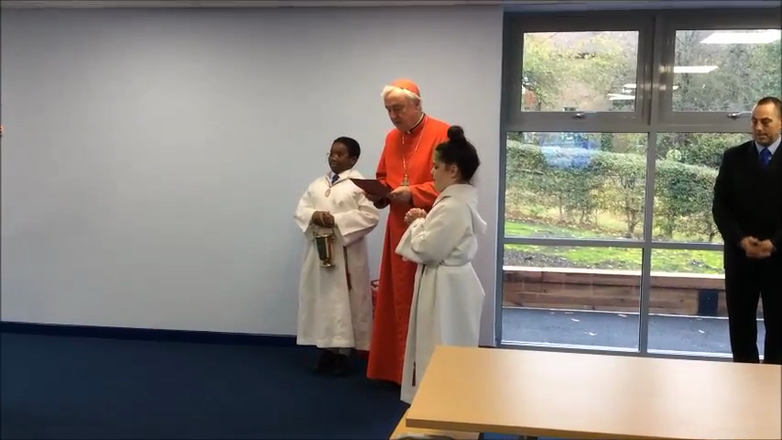 During the Liturgy, Father Michael arrived with Mr McGrath to give the children and the staff their ashes. 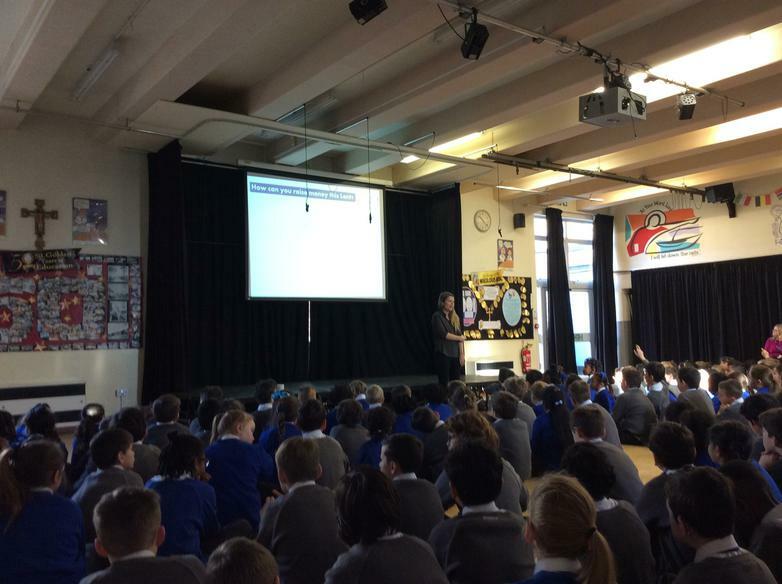 The children have discussed why Lent is so important and 4M brilliantly explained in their class assembly last week what the three pillars of Lent are. 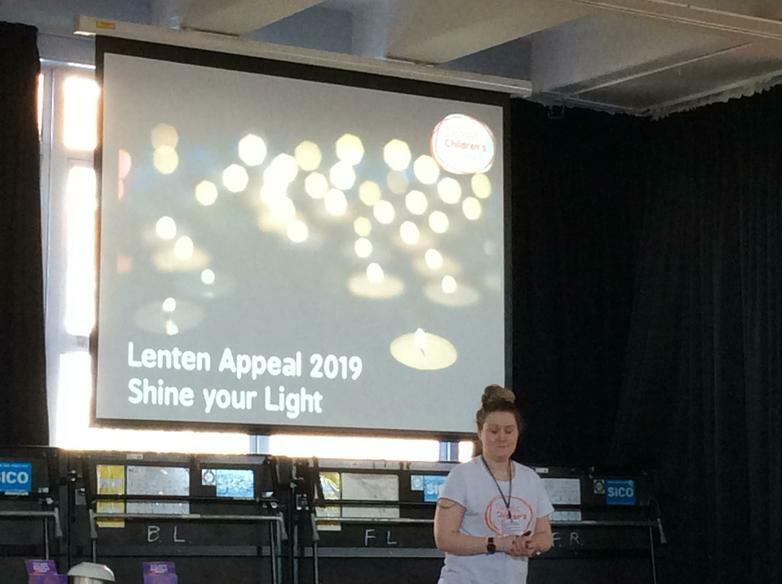 The Lenten appeal boxes have gone home with every child today and we would ask that you encourage you to support your child in helping this appeal for the Catholic Children's Society. A letter has also gone home explaining in detail why this appeal is being run and its importance. Prayer bags will also start going home from today so we hope you enjoy this reflective time at home as a family. As part of our Lenten preparations, the children will each get a turn to take home our Lent prayer bags. You will start seeing these bags going home tomorrow, Ash Wednesday, to mark the beginning of Lent. These bags will give the children, along with their family, the opportunity to take part in reflection time at home about this special season. 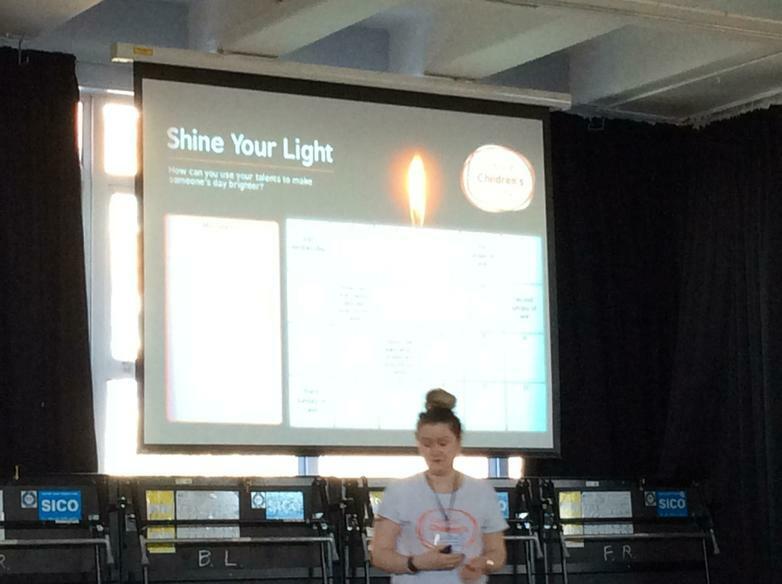 The children will also have the chance to write their own reflective prayer which can then be shared in class. Sorting cards - the children can look at the different activities and decide whether they are times when we pray, fast or give. Catholic Children's Society reflection book - this book offers stories of some of the children who have been helped from the donations made by us to the Catholic Children's Society. These stories also have reflections and prayers. 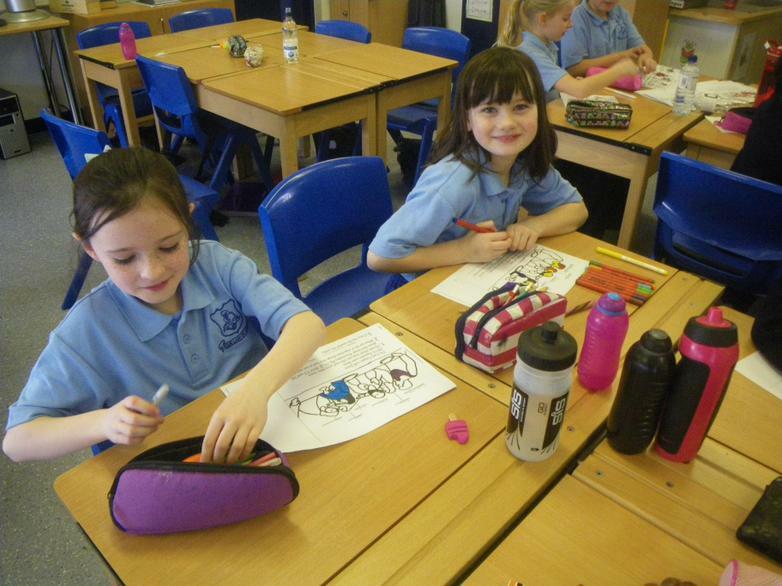 We ask that all children take very good care of the prayer bag when it is their turn and return it to school the next day with all of its contents. We hope the children really enjoy their turn with the prayer bags and we look forward to sharing the reflections they make in their class prayer journals. 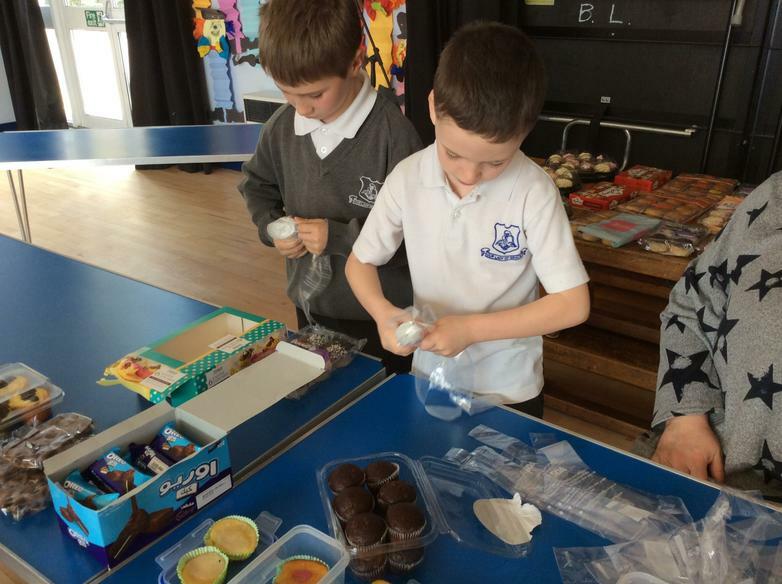 We hope this also encourages the children to keep any Lenten promises they have made and keep the Catholic Children's Society in their minds in order to raise as much money as possible for their Lenten appeal boxes. 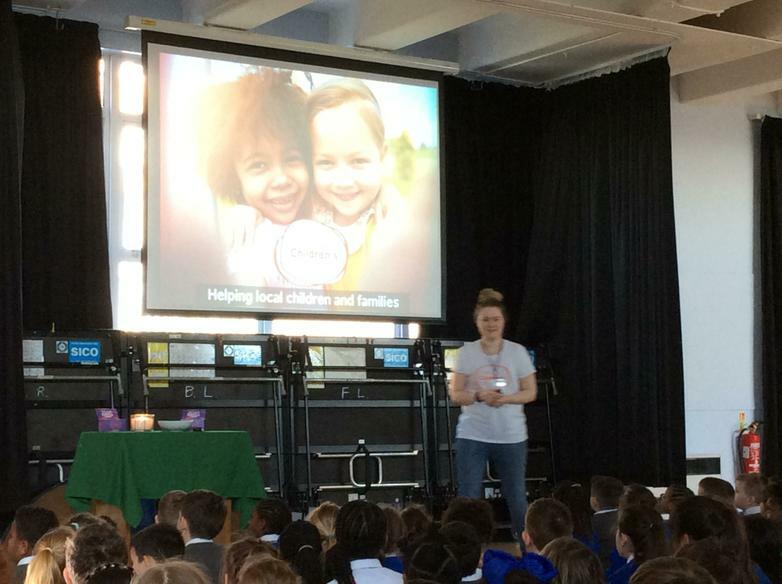 Last week, a member of the Catholic Children's Society visited the school to hold a special assembly for the children about their Lenten appeal this year. 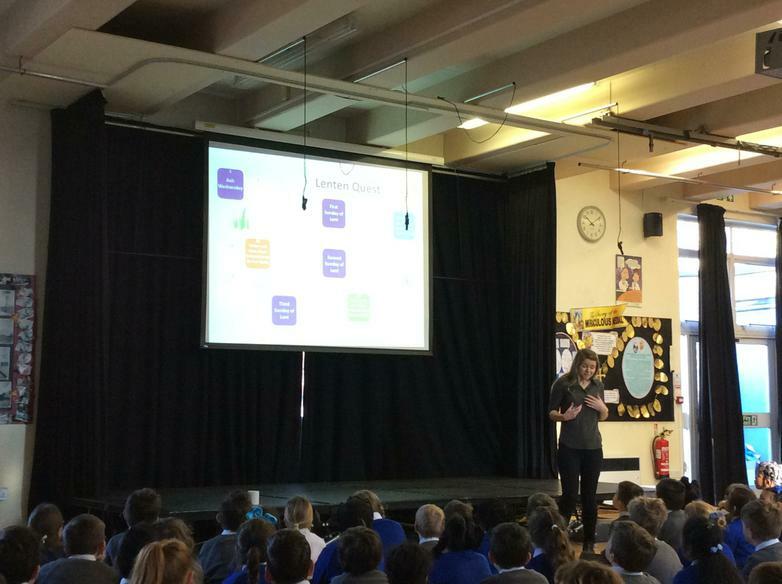 In this assembly, the children were thanked for all the efforts they have made in the past to raise money for the CCS and informed of how their donations are spent. 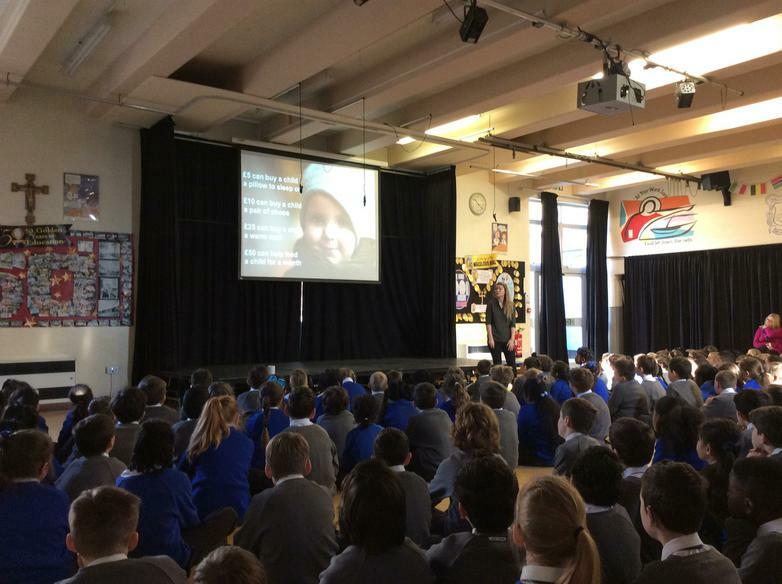 The children were introduced to this years Lenten appeal and given suggestions as to how they can show their support by making donations. The children will be coming home tomorrow (Ash Wednesday) with a donations box, activity sheet and information sheet about the appeal. Please support your children and the CCS by encouraging them to fill in their activity sheet as well as making donations to their box. 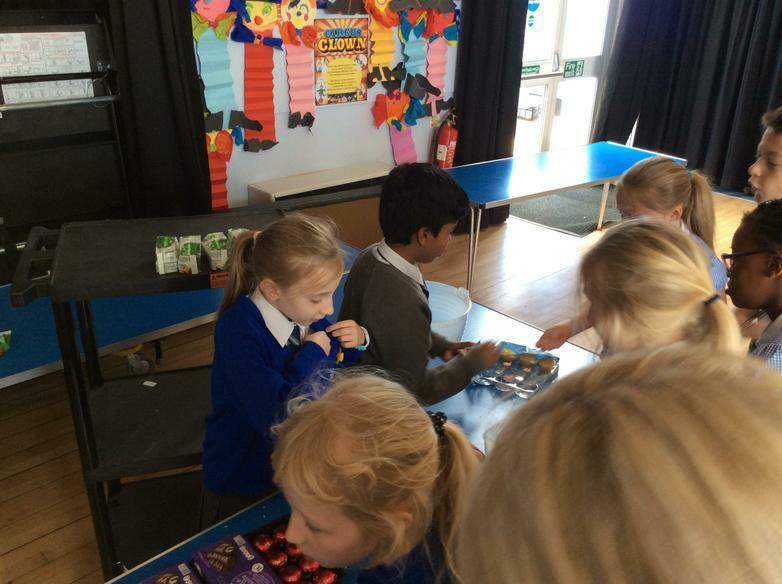 All Lenten boxes can be brought back into school for collection after the Easter holidays. 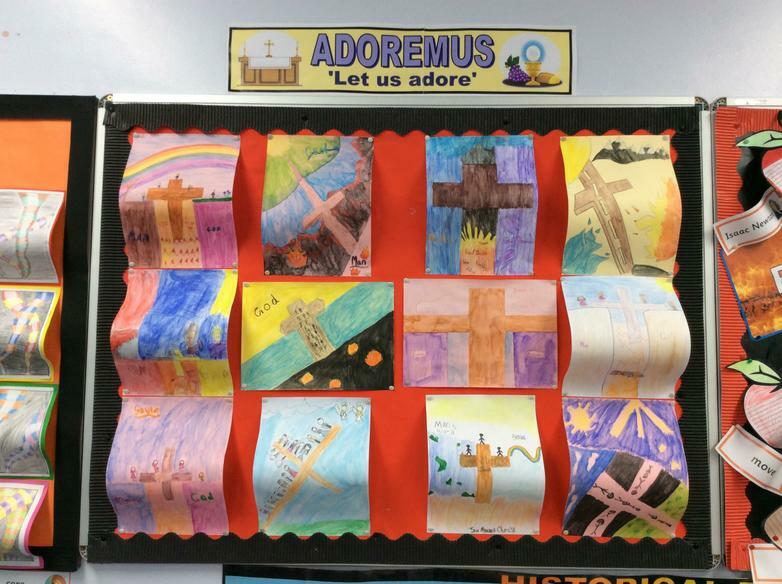 The children have been continuing their work on the topic of 'Adoremus' this term in their classes. 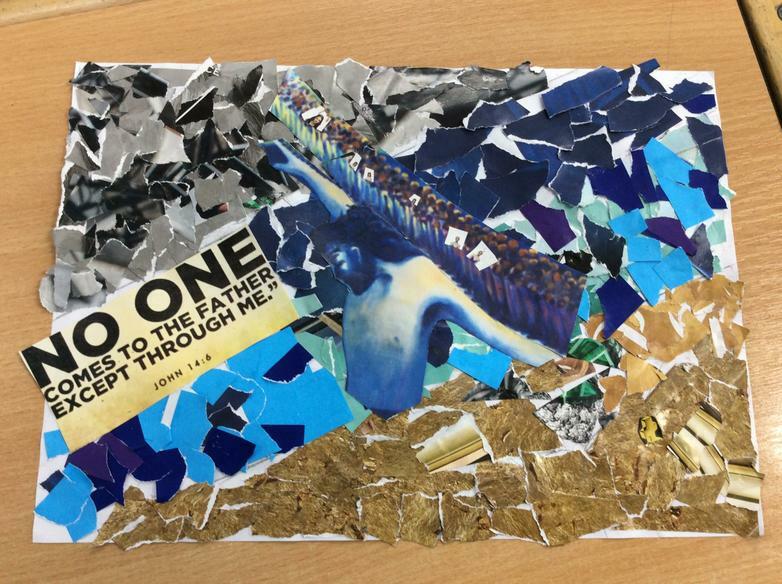 The children have been producing pieces of artwork inspired by 'The Bridge' by Elizabeth Wang and have also created pieces of poetry on the theme of 'Eucharist'. See below for a few examples of the work they have created. All of the children have had a session of Godly Play this week in Horizon House on the theme of Adoremus. Godly Play is a very different, but amazingly engaging, creative and imaginative method for exploring our Christian faith and heritage. The children have the opportunity to participate in Godly Play sessions with their teacher at the end of each term. 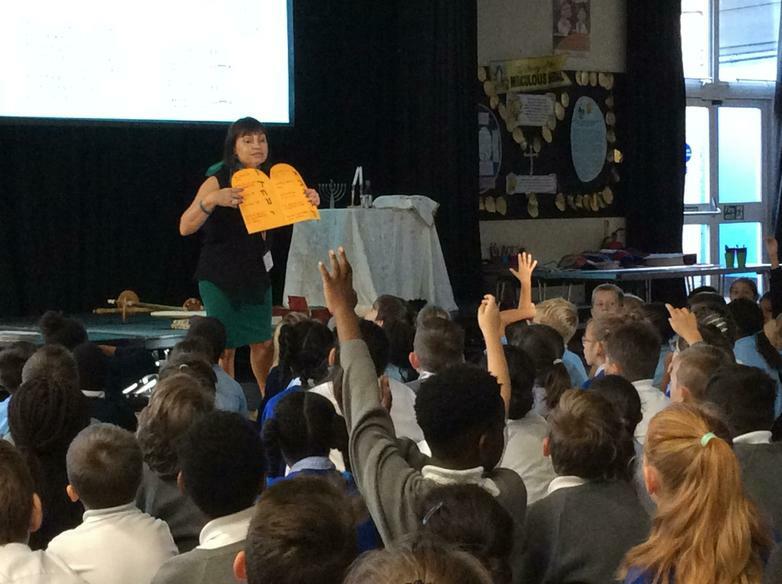 During their session this week, the children discussed the importance of the Bread and Wine and why we celebrate communion every week at mass. The children thoroughly enjoy their Godly Play sessions and always provide very meaningful answers during discussion. As part of our Advent preparations, the children will each get a turn to take home our Advent prayer bags. These bags will give the children, along with their family, the opportunity to take part in reflection time at home about this special season. 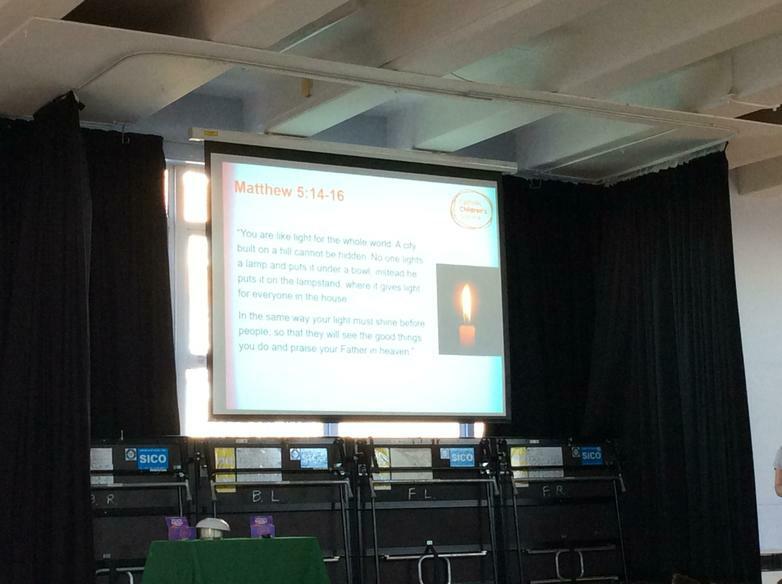 The children will also have the chance to write their own reflective prayer which can then be shared in class. •An Advent activity book and Advent prayer book. •A picture of the nativity. We hope the children really enjoy their turn with the prayer bags and we look forward to sharing the reflections they make in their class prayer journals. 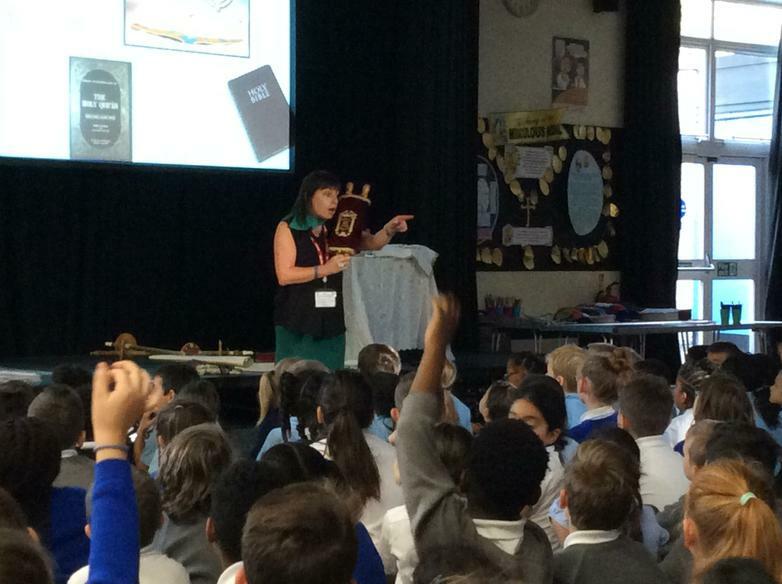 Please remind the children to bring back the prayer bag the next day so that the next child can use it. 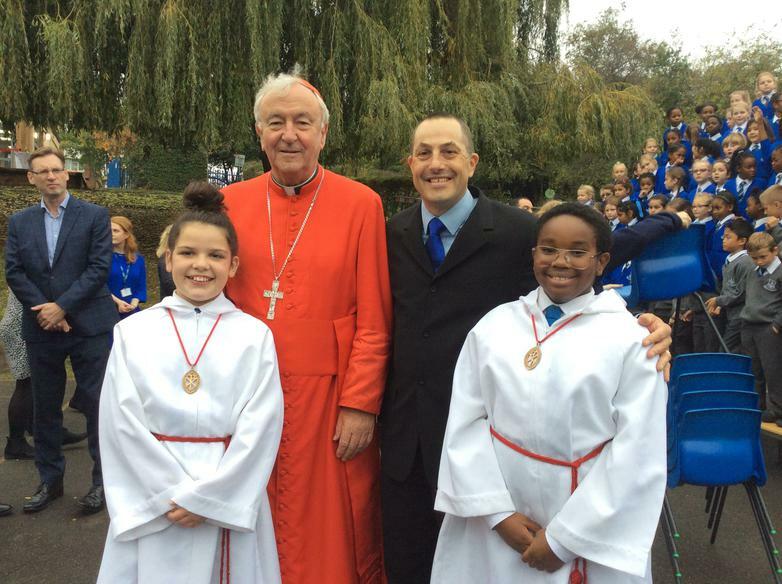 Adoremus is an initiative of the Catholic Bishops' Conference of England and Wales to create a special opportunity to reflect on the centrality of the Eucharist in the life of the Church. 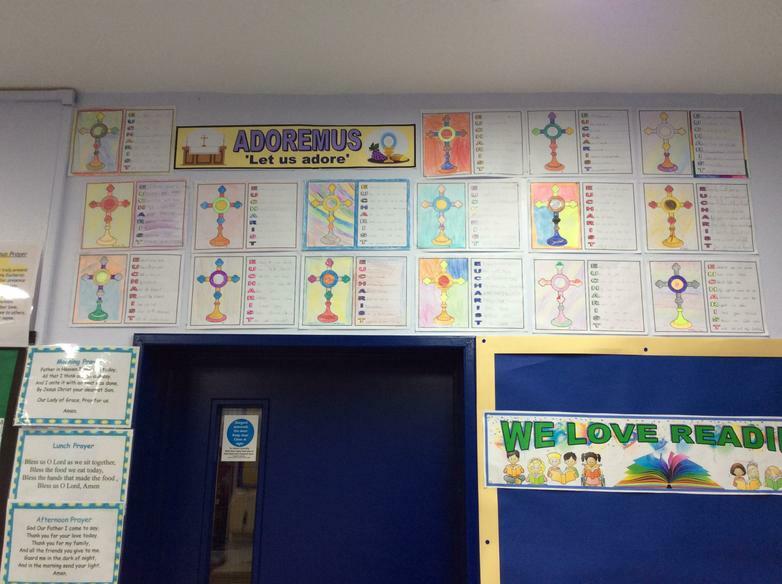 Adoremus (latin for let us adore) has a strong focus on Eucharistic adoration and gives the children an opportunity to reflect on the importance of the Eucharist in their lives. 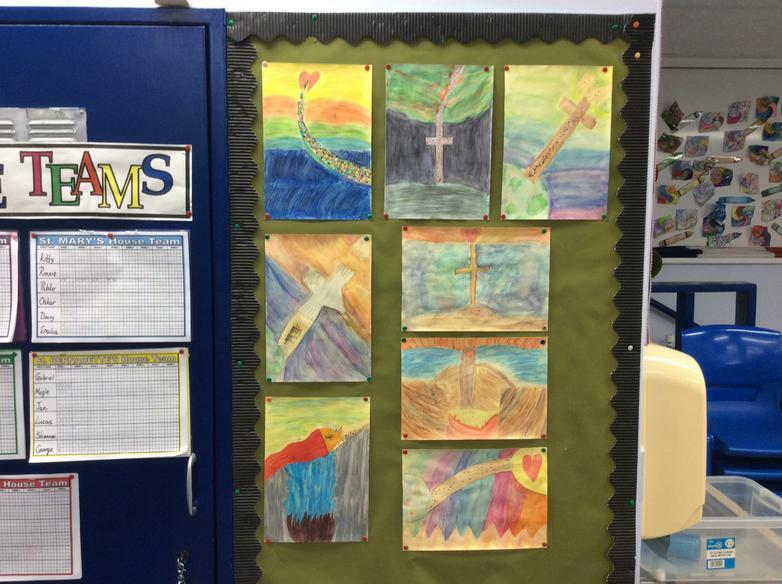 Each year group has been exploring the meaning behind Adoremus in their classes and they have completed beautiful pieces of art work which are now on display in every classroom. 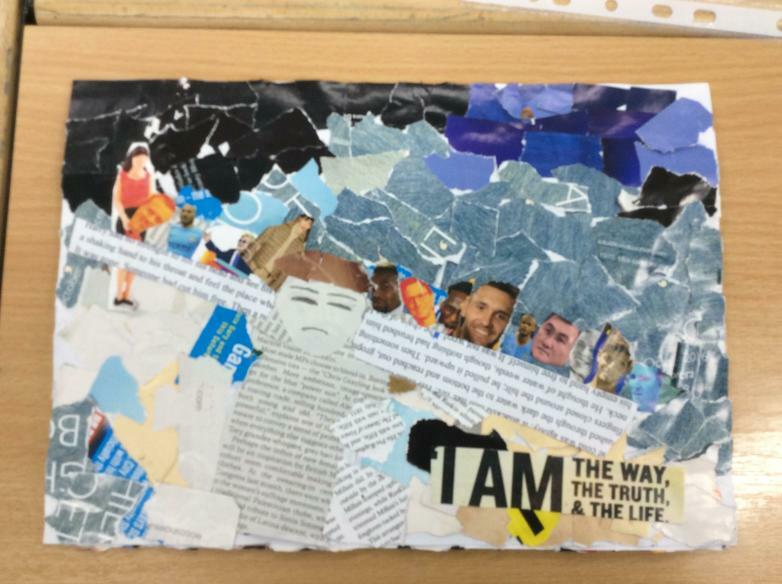 This work will continue throughout the year and examples of what they have completed will be uploaded to the school website for you all to enjoy. Please see below to look at what each year group has done so far. 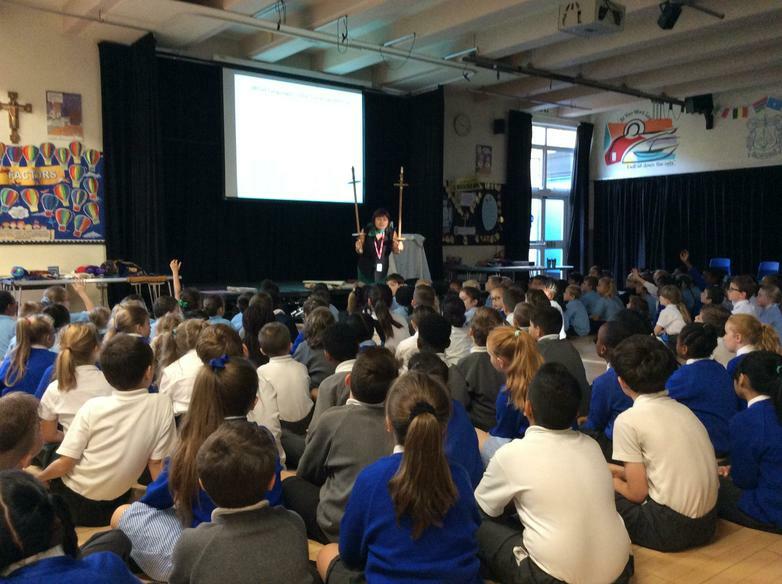 The children have been introduced to some key vocabulary and had a chance for discussion on words such as Blessed Sacrament, Altar, Tabernacle and Transubstantiation. 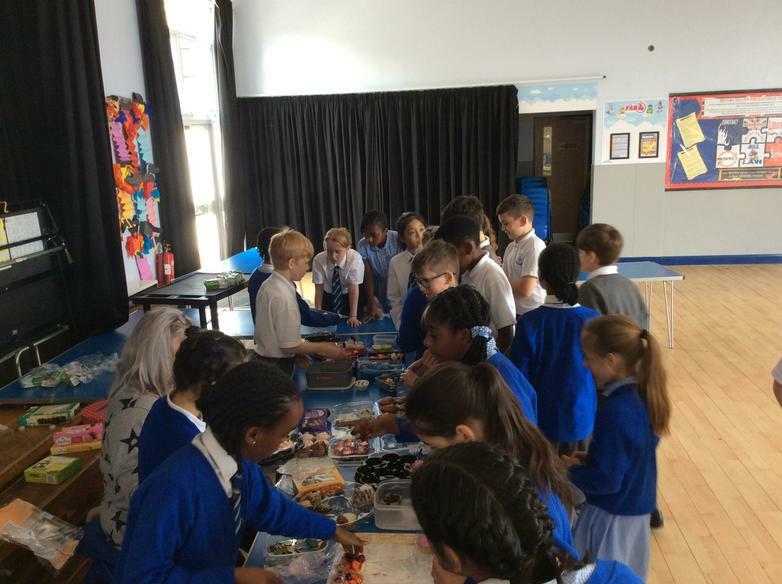 The children explored how the Eucharist can be represented through art and firstly looked at ’The Sacrament of the Eucharist’ by Salvador Dali. They worked in pairs to talk about what they noticed in this picture and how they think it showed the Eucharist. 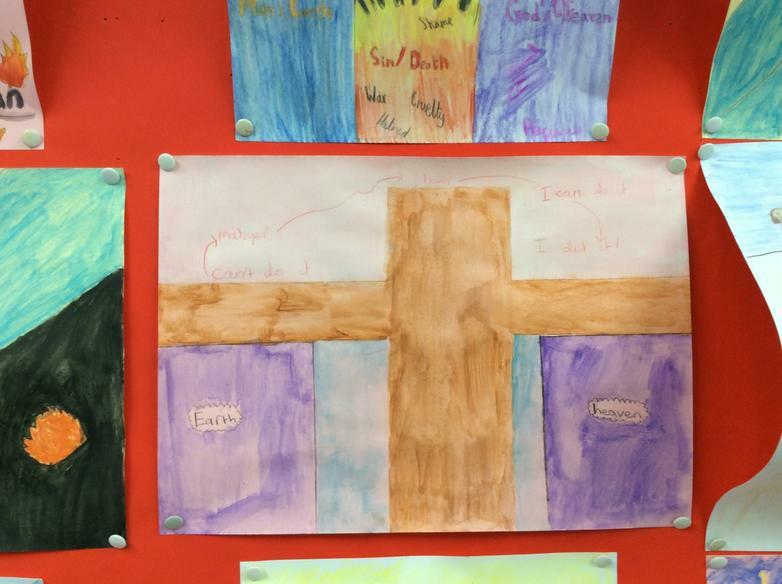 From this discussion, they then looked at other examples of work that different children had created before firstly creating their own interpretation of what the Eucharist means to them and then choosing one piece to focus on as a class to recreate. 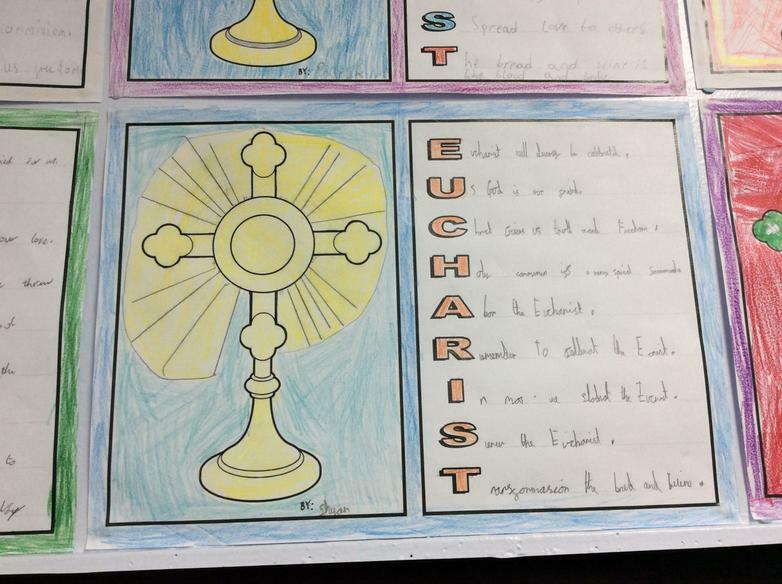 We began by discussing the children’s personal experiences of the Eucharist. 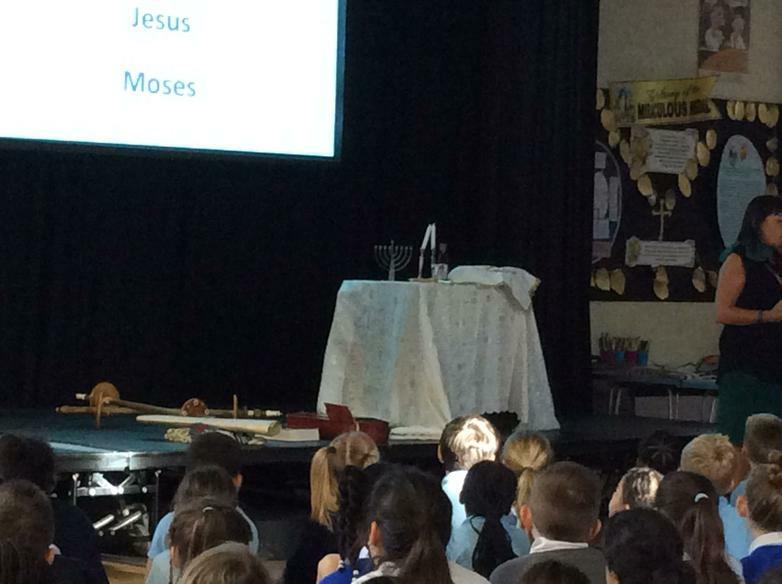 The lesson explained what the Eucharist is and that it is a re-enactment of the Last Supper in mass. 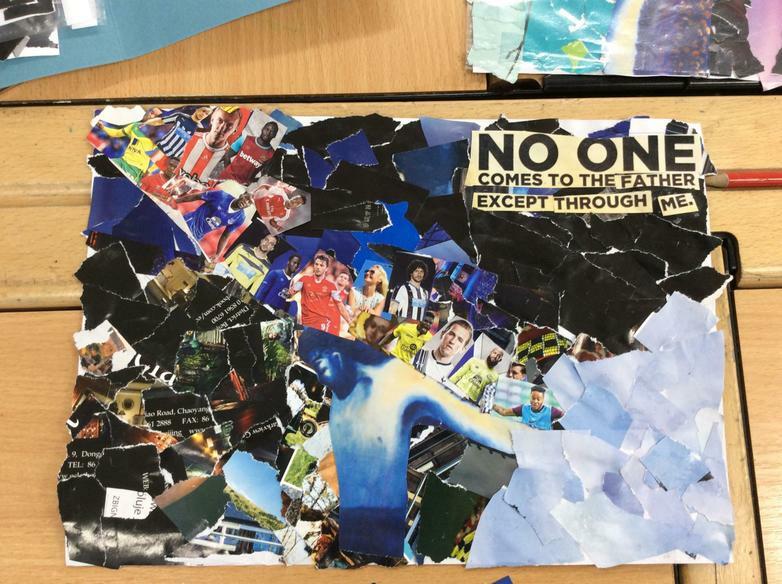 The children created a collage of the bread and wine contemplating the moment in mass when the bread and wine turns into the body and blood of Christ. 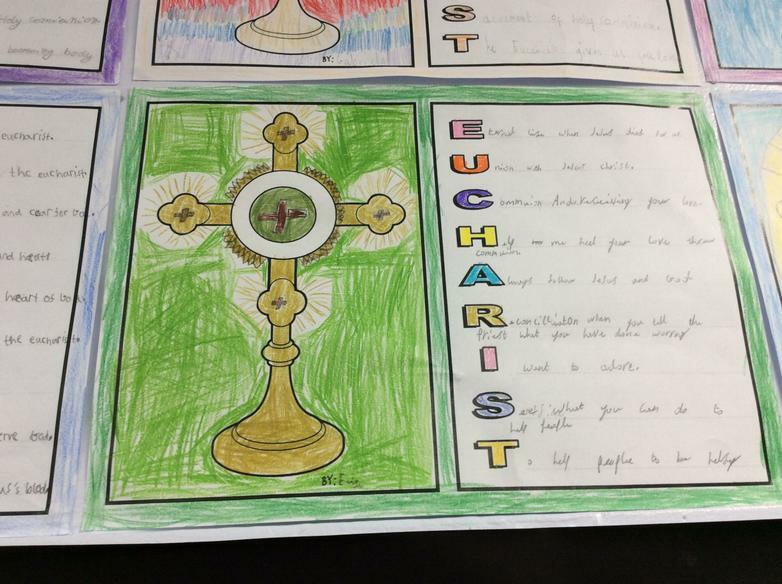 Finally, the children wrote a reflective piece on what the Eucharist means to them and how it strengthens their faith. Hope - of the eternal life we will share with the Father. Community - being with God and loving each other in our community etc. 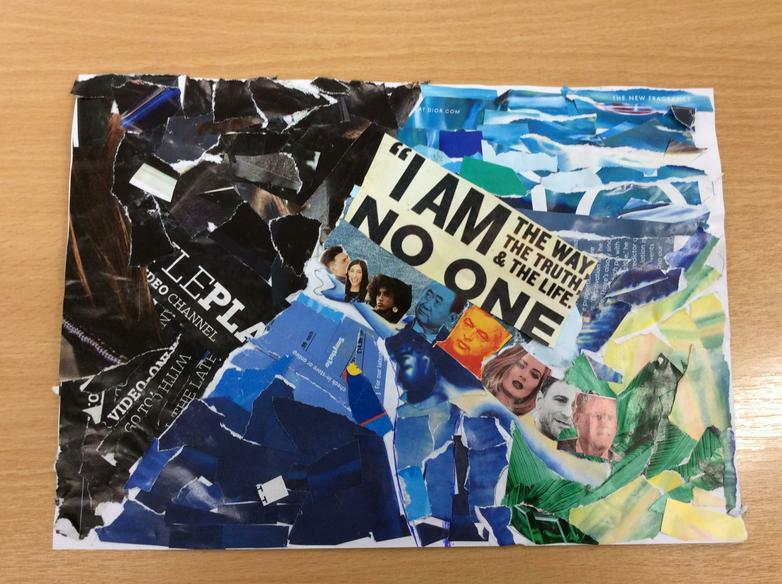 The children then designed an art piece to show their understanding of these concepts. 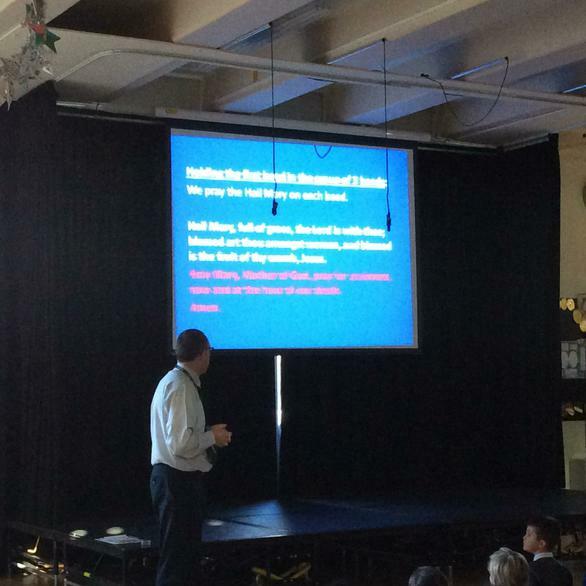 In Year 6 the children have written Adoremus acrostic poems. 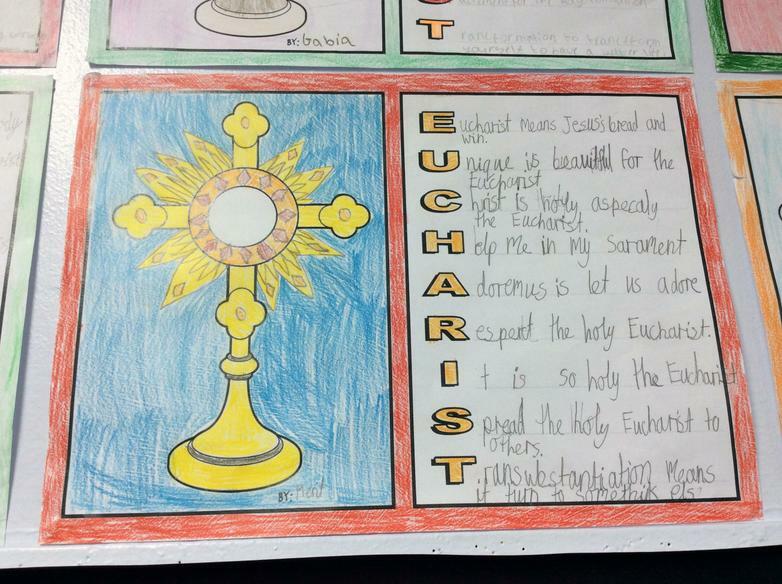 The children have looked at the importance of adoring the Eucharist and the mystery of the Eucharist. The children have then written their poems in the template of the chalice and host with the rays of light emanating from this image. 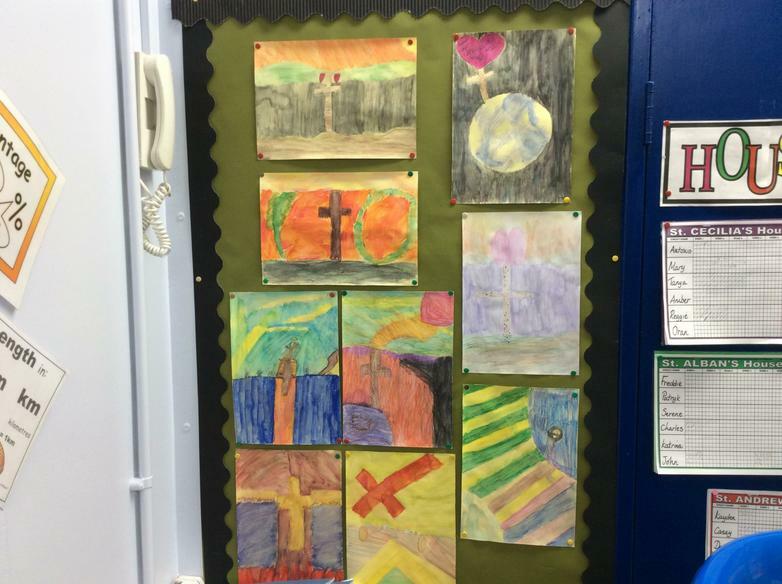 They have used water colours to create a stained window effect. These will be displayed on the class windows. 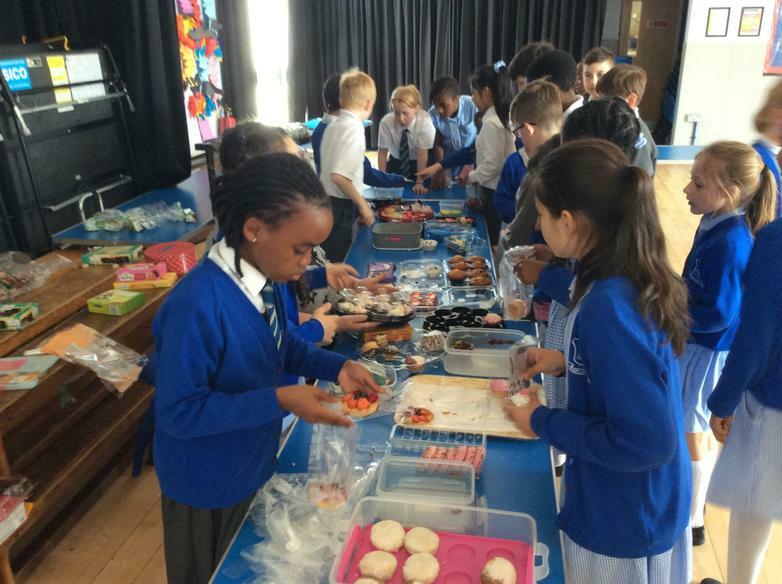 At this year's Christmas Bazaar, the Mini Vinnies began raising money for the St Vincent De Paul Society. 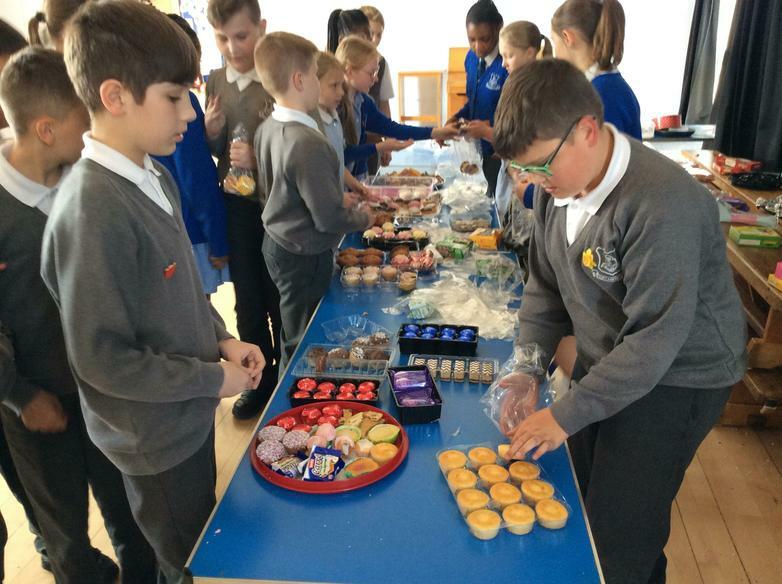 They successfully ran a stall where people could 'Guess the weight of the cake' and 'Guess how many sweets are in the jar' to win them as a prize! 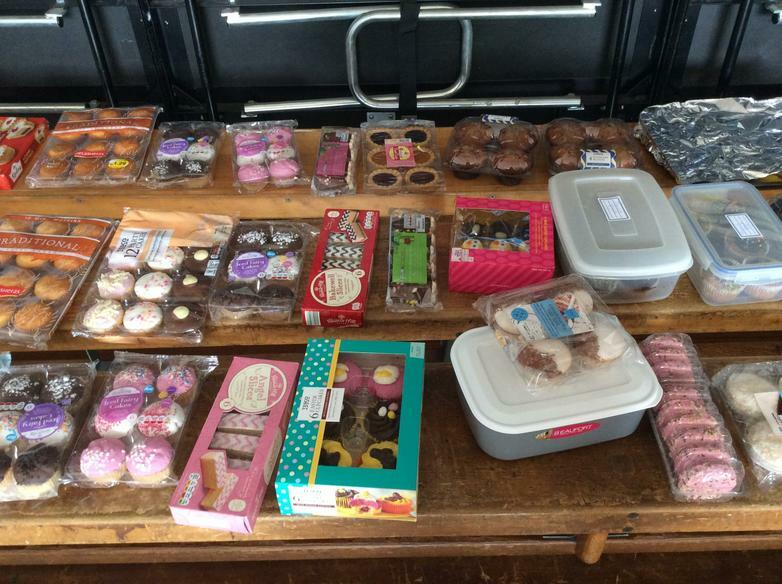 There were 306 sweets in the jar and the cake weighed 2.597kg. Congratulations to our winners for getting the closest guesses! 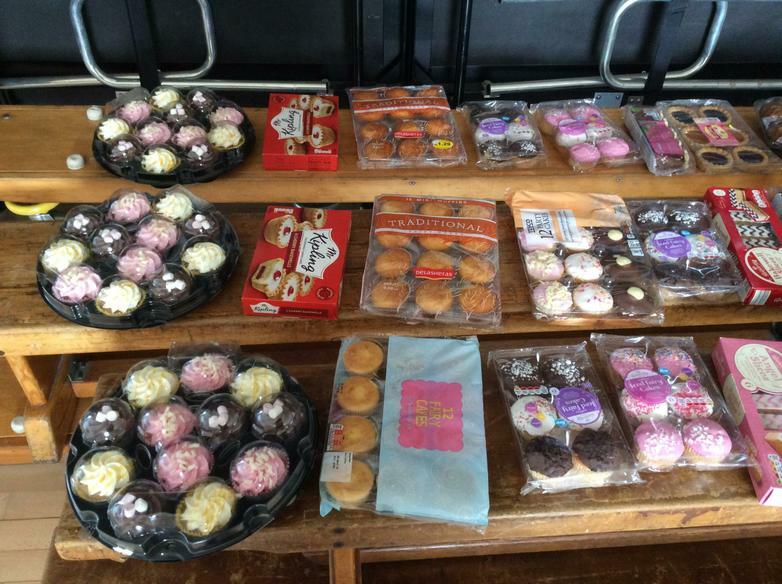 We were also able to give a second prize in the cake competition thanks to the generous donation of another cake! 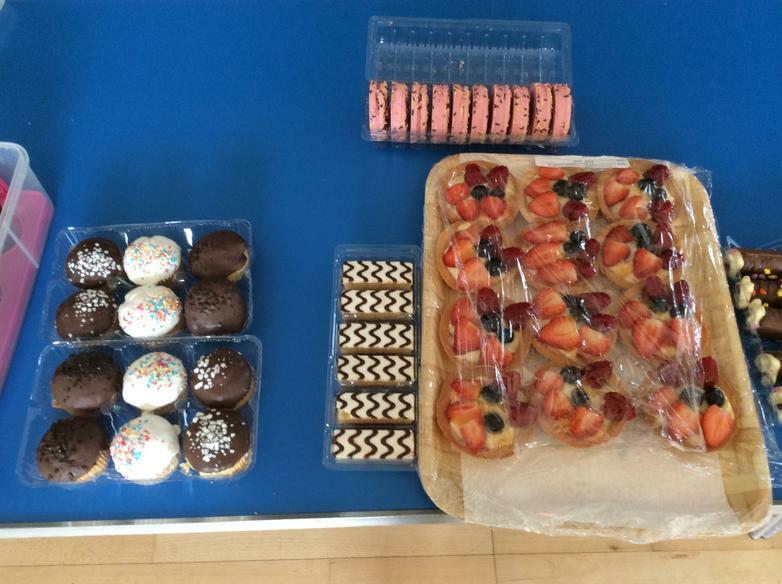 Second prize went to Justyna who guessed the cake weighed 2.35kg. 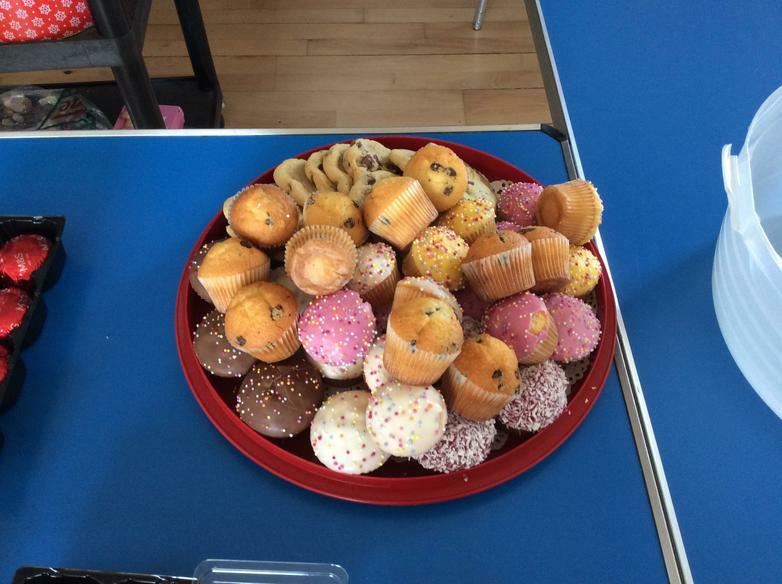 A big thank you to all of the Mini Vinnies who were able to help Miss Dunne on the day and also a big thank you to Miss Ashley who very kindly baked and donated the cake that we weighed! 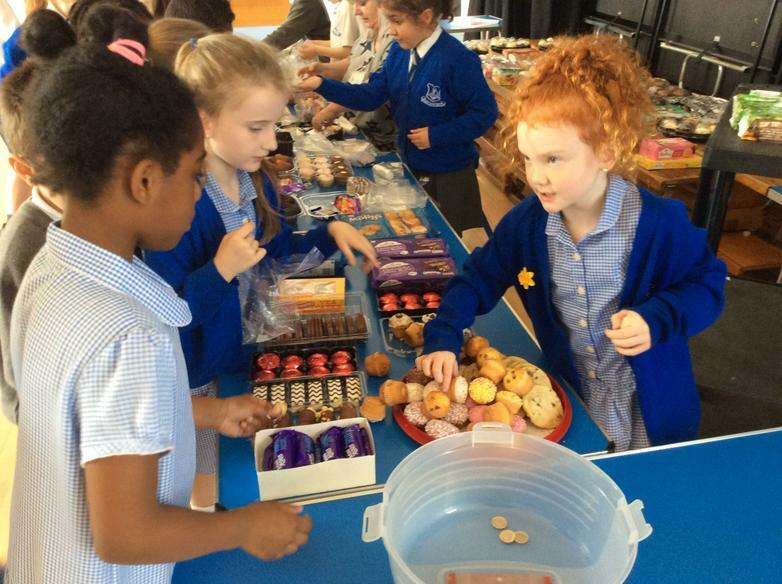 We have had another very successful Harvest this year at Our Lady of Grace Junior School thanks to the generosity of the people in our school community. 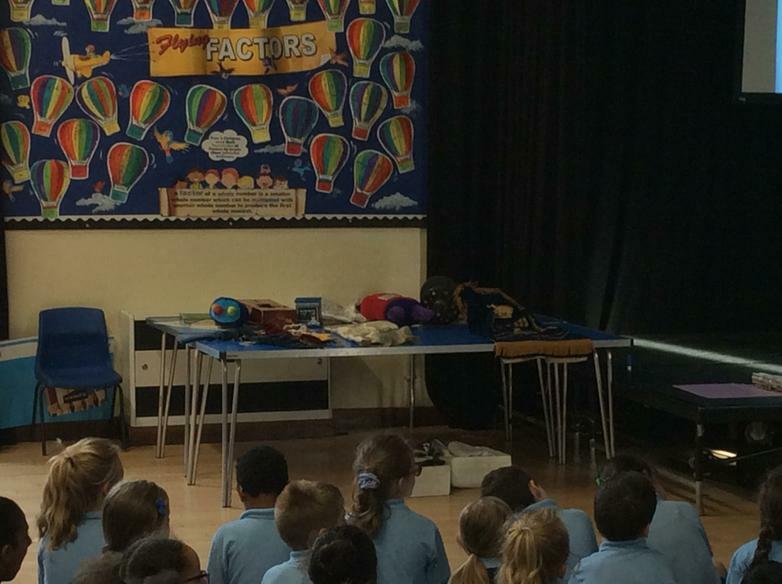 We were able to collect over 700 items for Ashford Place which was presented to a representative at 3O's Harvest assembly. 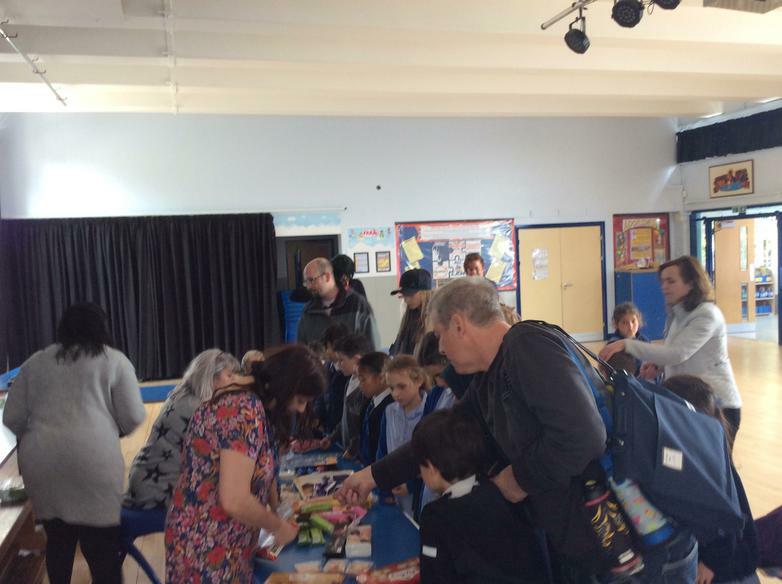 Another big thank you to everyone who was able to donate to our CAFOD Harvest collection. Everyone's generosity plays a massive part in helping those less fortunate than we are. 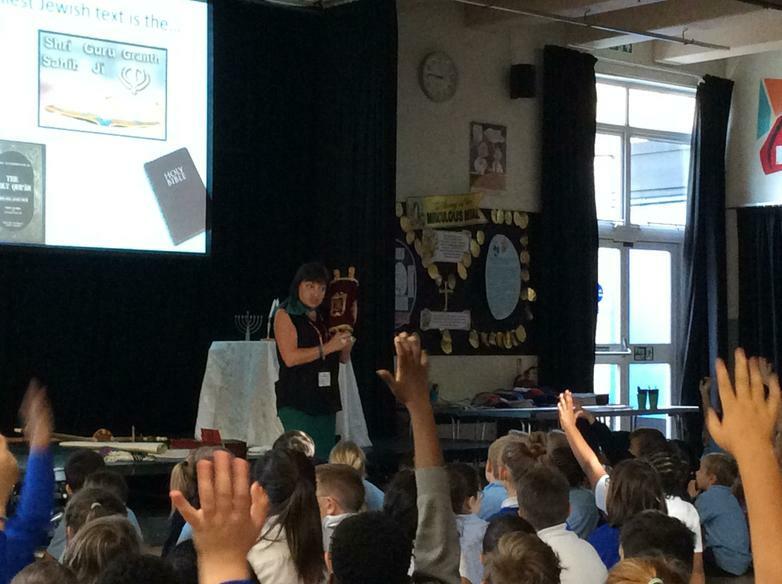 In school this week, the children have been exploring Judaism in their RE lessons. 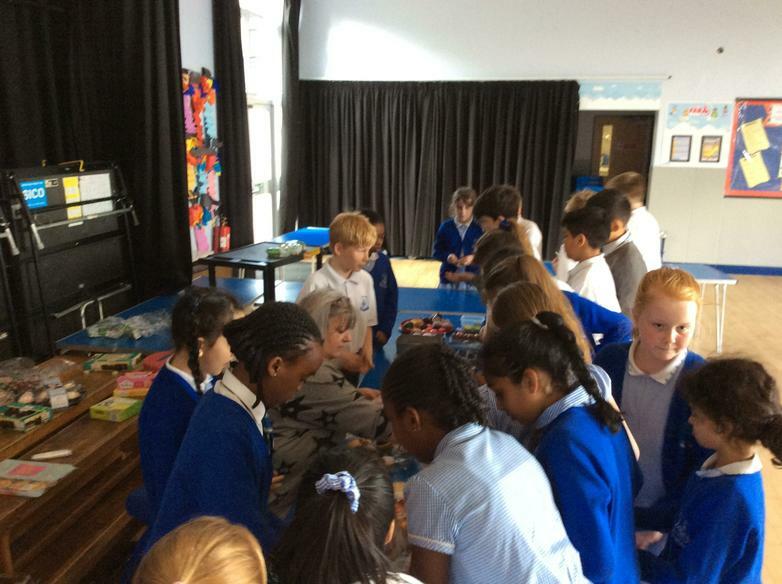 Each year group has been focusing on different aspects of Judaism such as learning about the story of Moses or about different Jewish celebrations. 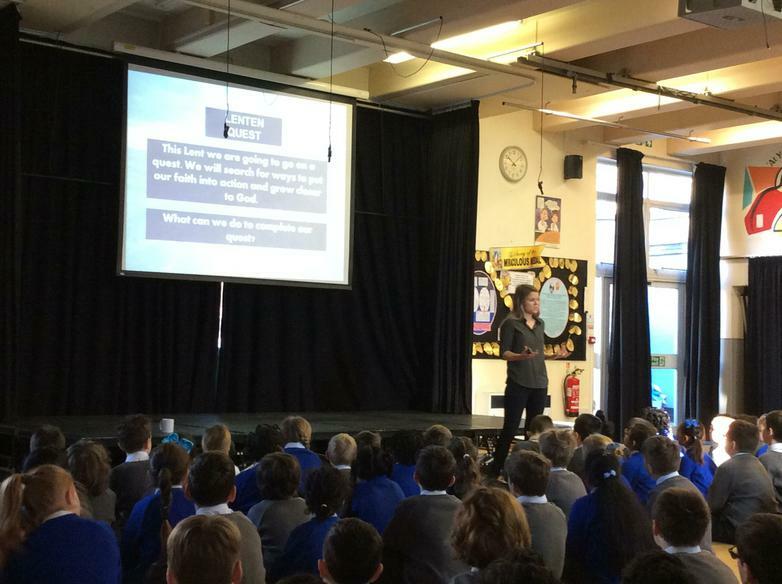 On Friday, the children participated in a whole school assembly and workshops with a visitor to the school who taught them even more facts about Judaism. 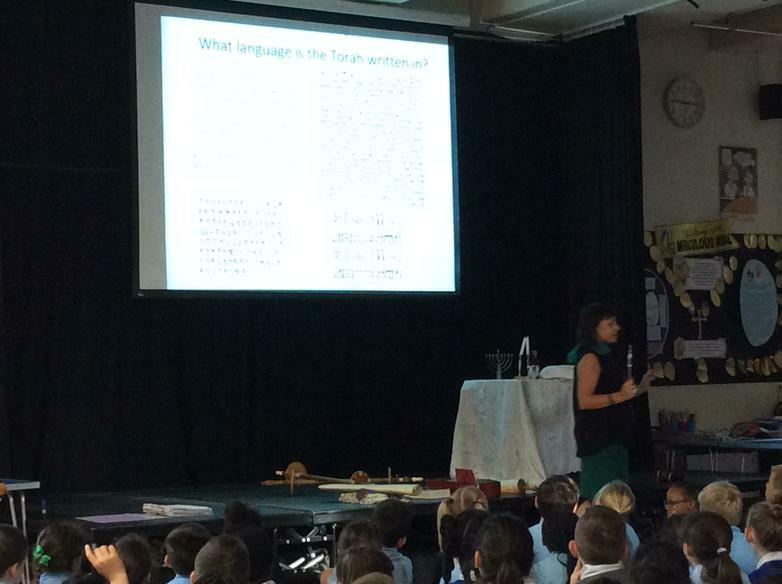 Year 3 focused on Shabbat, Year 4 focused on the Torah, Year 5 focused on Passover and Year 6 focused on Jewish New Year. All of the children participated very well during the week. Well done! 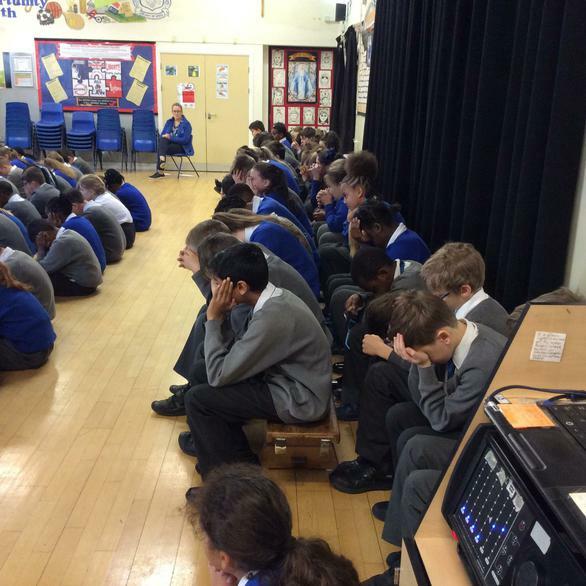 Every Wednesday during the month of May, Miss Dunne will be holding a Rosary Prayer group. This is to mark May being the month that we dedicate to Our Lady. The term “rosary” comes from “rosarium,” or a bouquet of roses; the prayers of the rosary were seen as a spiritual bouquet offered to Mary. 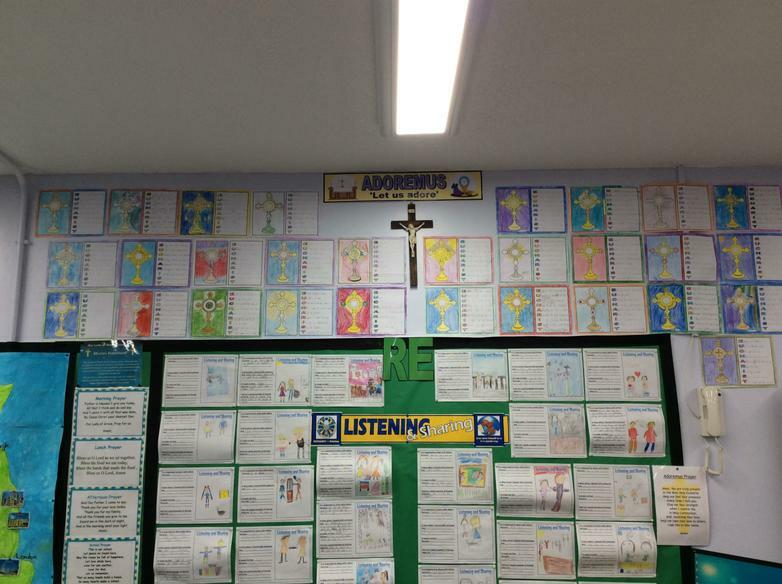 All children are welcome to join Miss Dunne on Wednesday lunchtimes and may like to bring in their own rosaries from home to pray with. 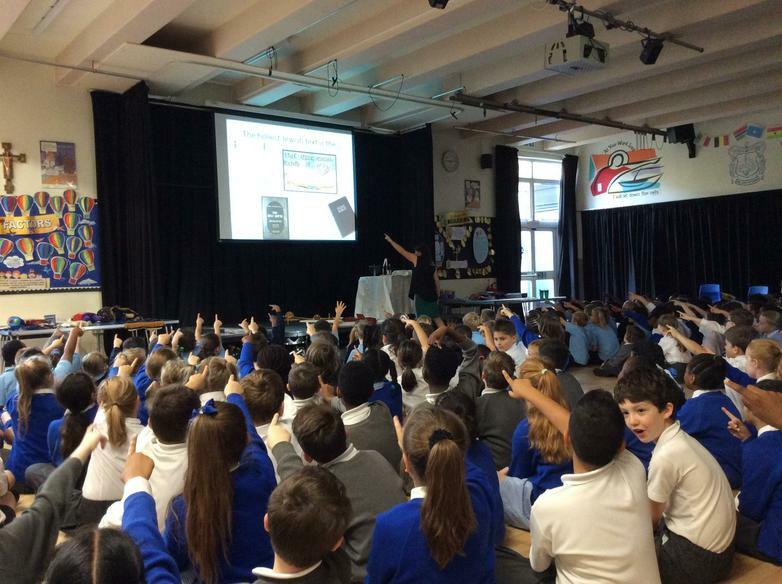 Thank you to all the children who attended the first session today. Please read the letter attached below informing you of a Religious Education inspection that will be carried out across the school tomorrow. As part of our Lenten preparations, the children will each get a turn to take home our Lent prayer bags. These bags will give the children, along with their family, the opportunity to take part in reflection time at home about this special season. 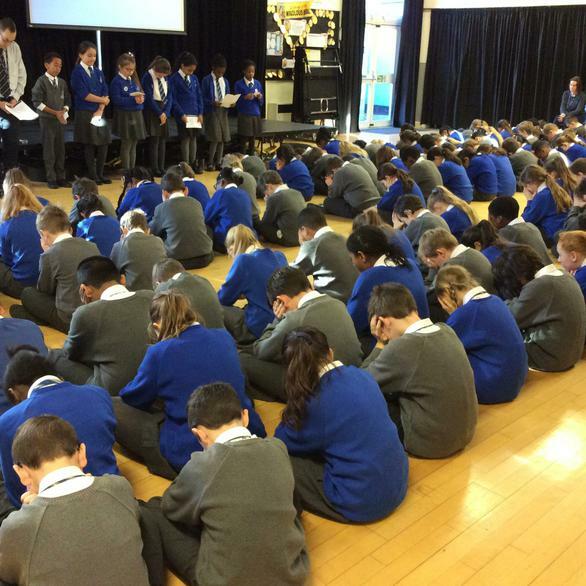 The children will also have the chance to write their own reflective prayer which can then be shared in class. On Tuesday, a member of the Catholic Children's Society visited the school to hold a special assembly for the children about their Lenten appeal this year. 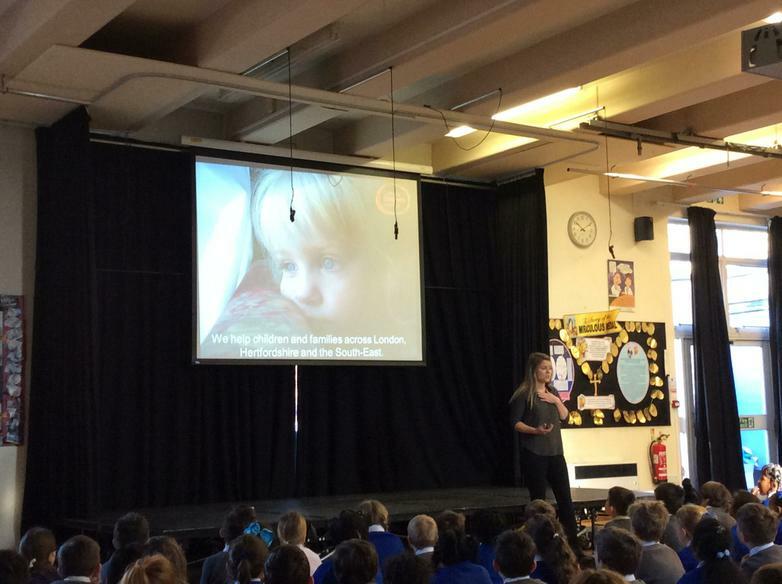 In this assembly, the children were thanked for all the efforts they have made in the past to raise money for the CCS and informed of how their donations are spent. 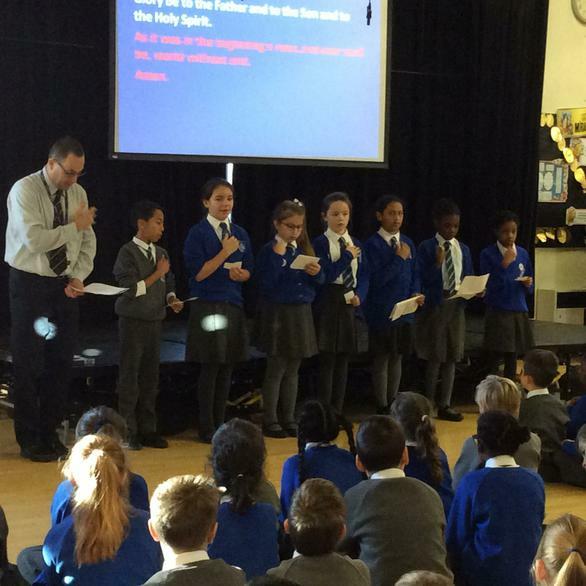 The children were introduced to this years Lenten appeal and given suggestions as to how they can show their support by making donations. 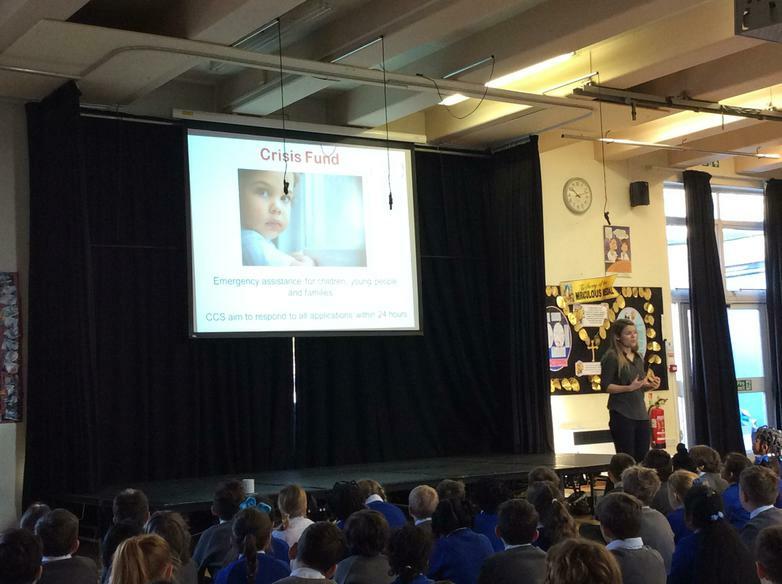 The children will be coming home this week with a donations box, activity sheet and information sheet about the appeal. 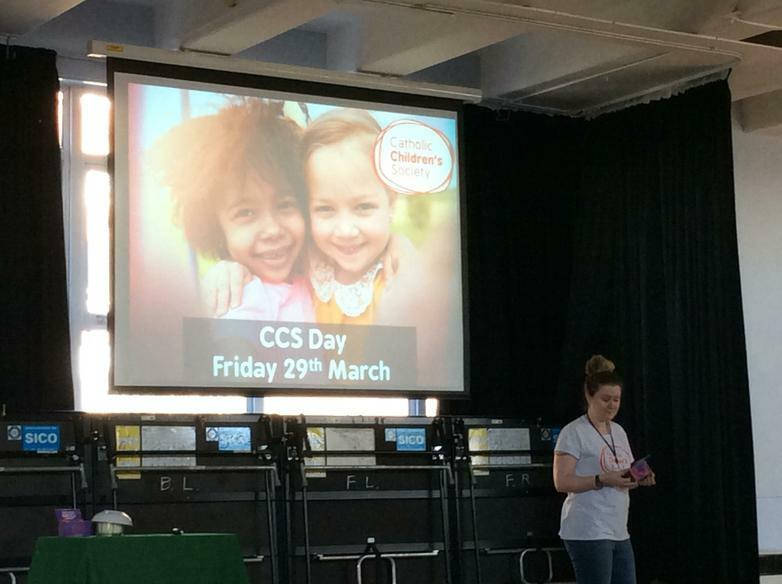 Please support your children and the CCS by encouraging them to fill in their activity sheet as well as making donations to their box. 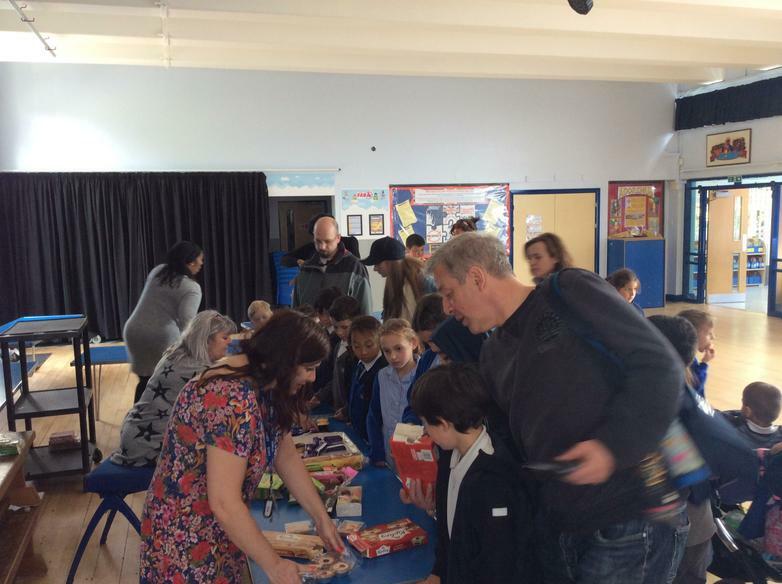 All Lenten boxes can be brought back into school for collection after the Easter holidays. 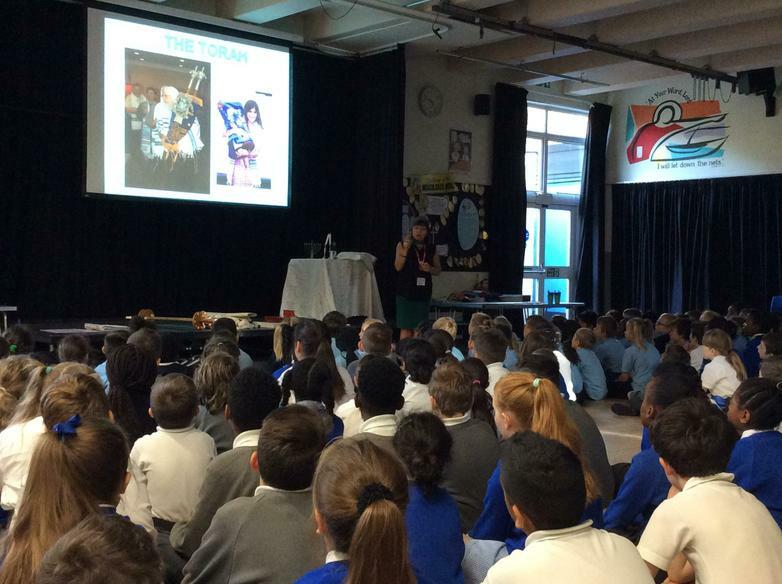 On Tuesday 12th December, Miss Dunne took the Mini Vinnies down to Westminster Cathedral for an Advent Carol Service. 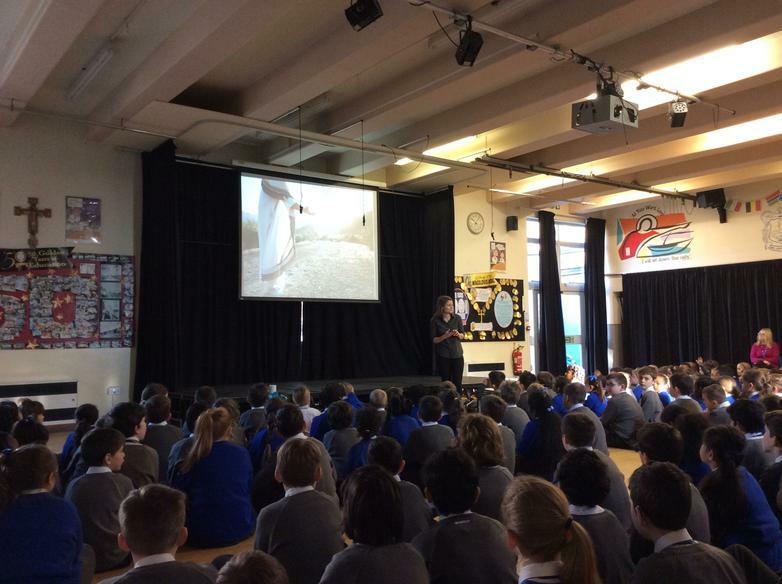 The children thoroughly enjoyed their visit and sand beautifully along to all of the carols. They were particularly amazed when an actual donkey arrived at the cathedral while everyone sang 'Little Donkey'! Everyone listened intently as the Christmas story was narrated, acted and sang along to which got everyone in the Christmas spirit. A lovely morning was had by all. We hope the children really enjoy their turn with the prayer bags and we look forward to sharing the reflections they make in their class prayer journals. 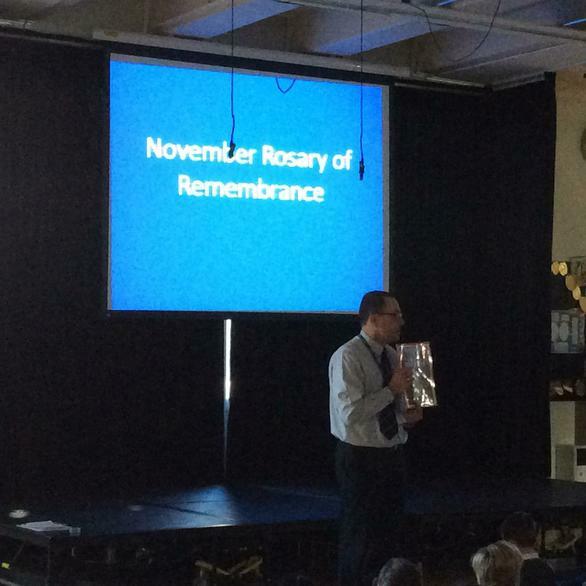 On Thursday 30th November, the Mini Vinnies hosted a special assembly to mark the end of our Remembrance month. 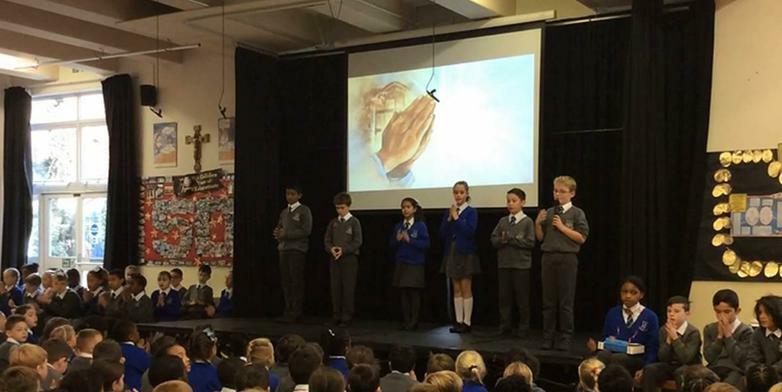 During this assembly, the children were reminded of the Remembrance book which holds the names of all of the people who we kept in our prayers this month. 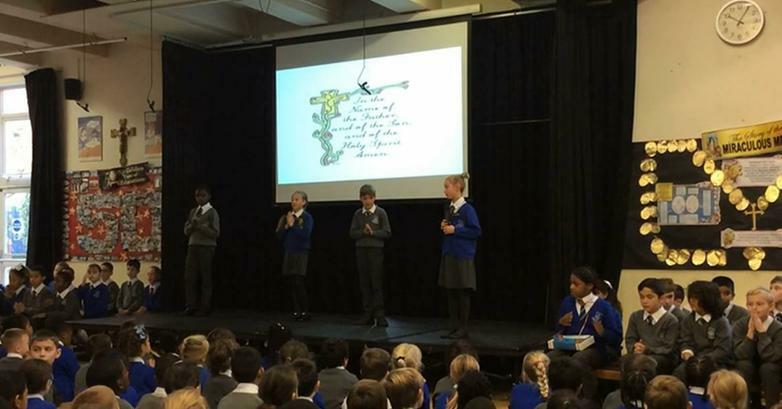 Some children chose to bring in their own rosary beads for this occasion as it also consisted of the whole school saying one decade of the rosary together. Well done to the Mini Vinnies for their help and for their beautiful, clear reading. 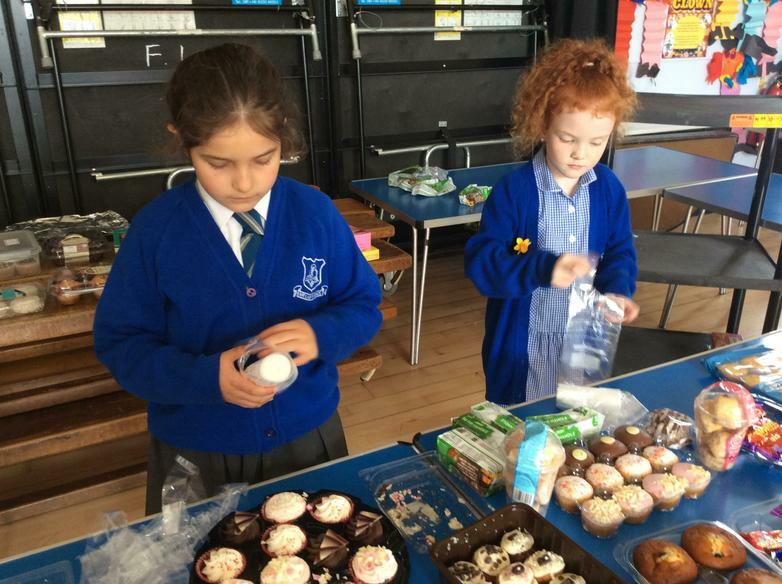 The Mini Vinnies held their first fundraising event at the school's Christmas Bazaar on Saturday 25th November. 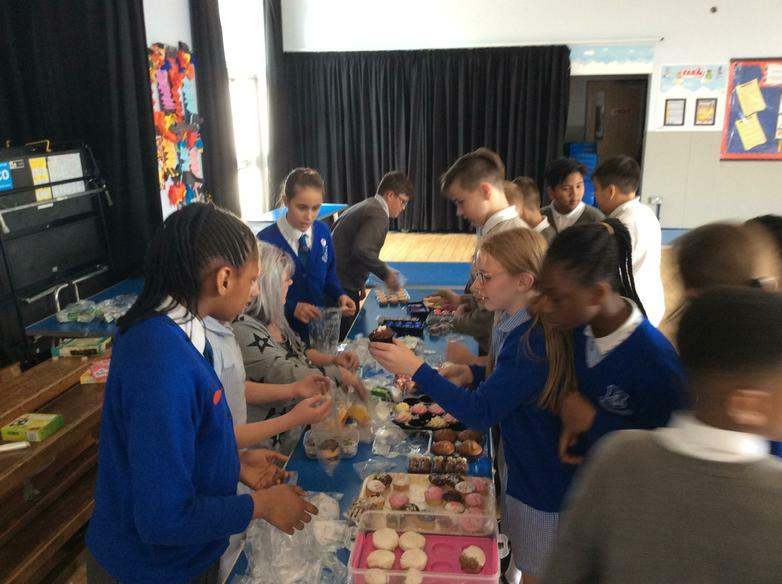 The children sold teddies donated by the school community to raise £107 for the St Vincent de Paul Society. 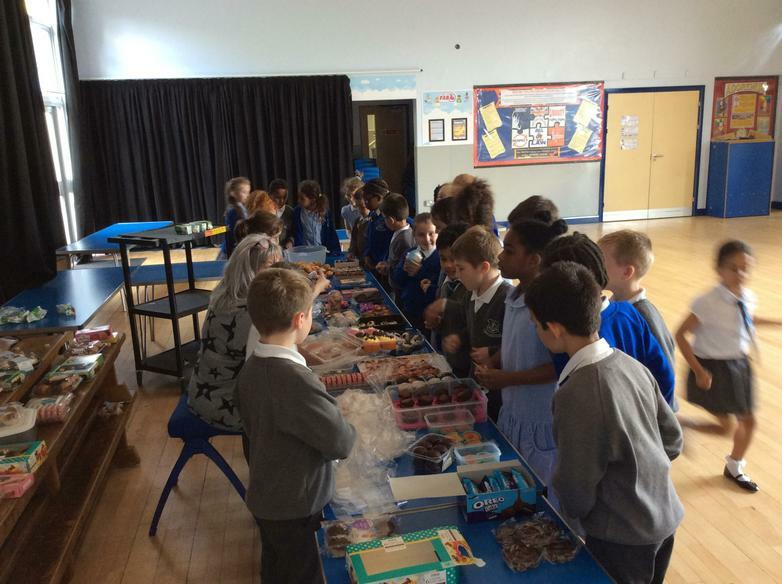 Well done to the Mini Vinnies for their hard work promoting this event to the children in their class, creating a poster to advertise it and for helping with the running of the stall on the day! 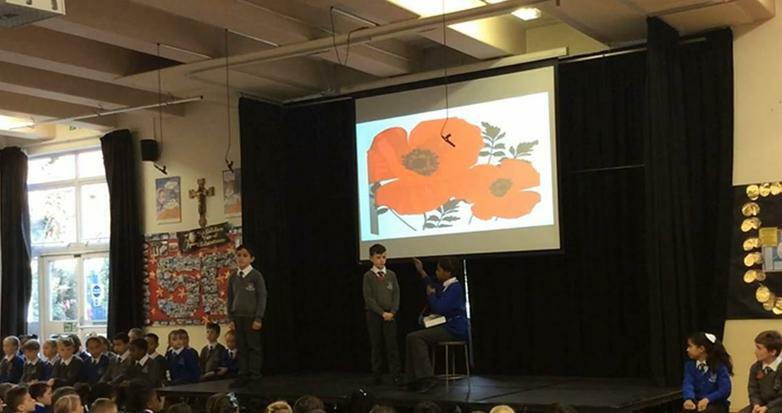 On Thursday 9th November 2017, class 5P held a beautiful assembly for the school and parents to explain the importance of Remembrance Day. 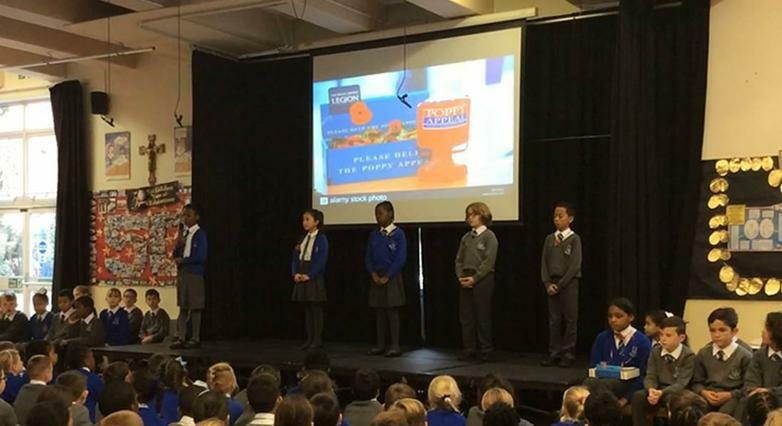 The children did an excellent job explaining to everyone why this day is celebrated and its importance. 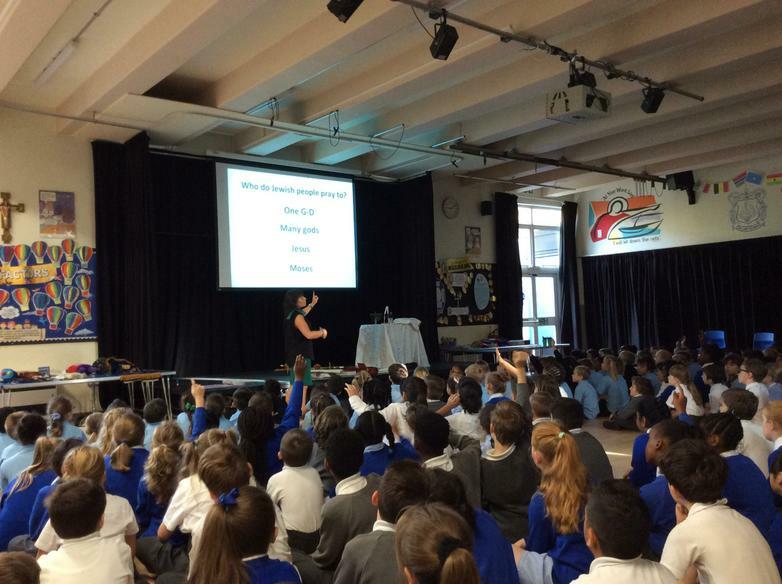 Thank you to 5P for such a special assembly. As we are now in the month of November, we especially pray for and remember those of our loved ones who have passed away. The children have all added a name and message to our Remembrance book which is currently in the entrance of the school office. 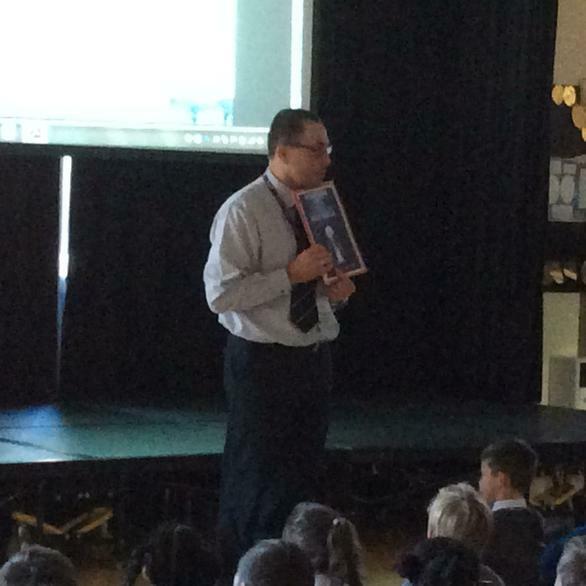 Please come and have a look at this special book. You are also very welcome to add the name of someone you would like us to remember during this month. 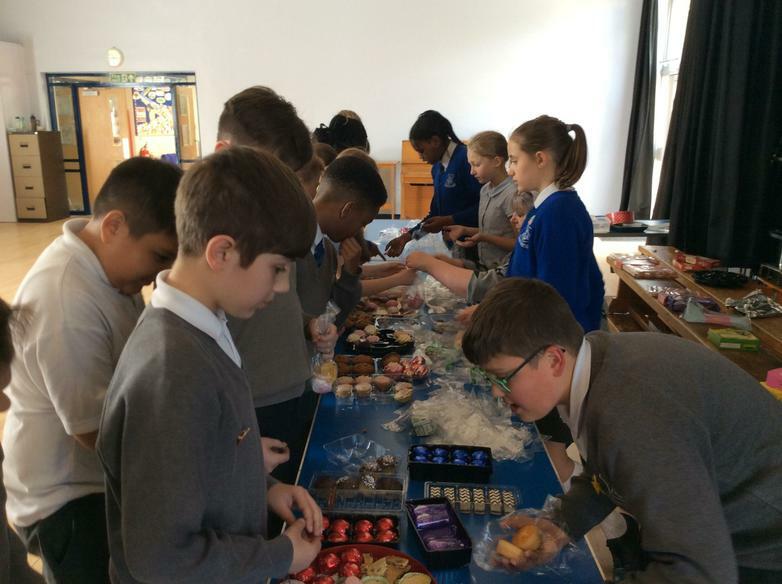 Some Year 6 children have spent the last two weeks using their break times and lunch times to go into the playground and sell poppies to the children and staff. 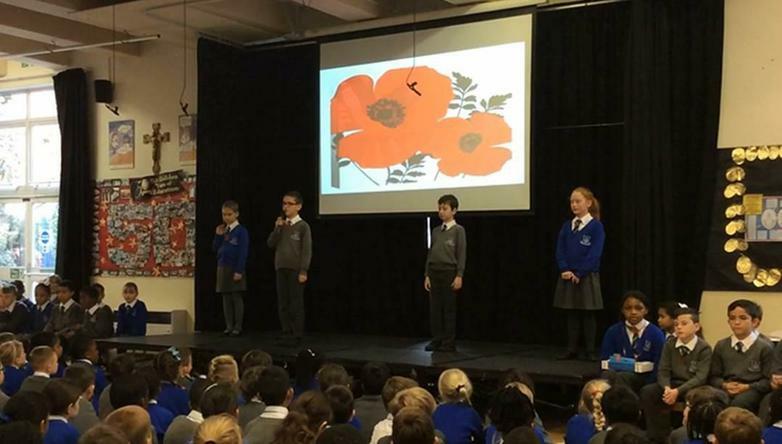 We are really happy to say that we have sold all of the poppies and we thank everyone for the generosity. 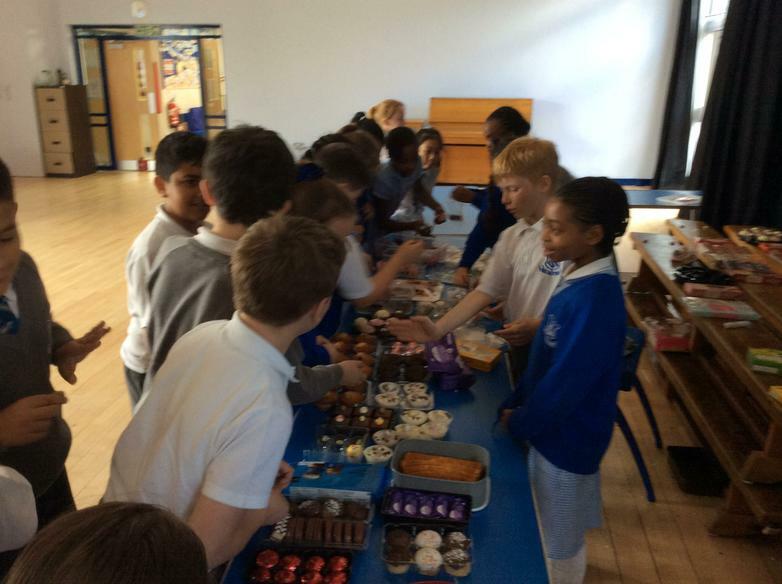 Thank you also to the Year 6 children who took the time to help. 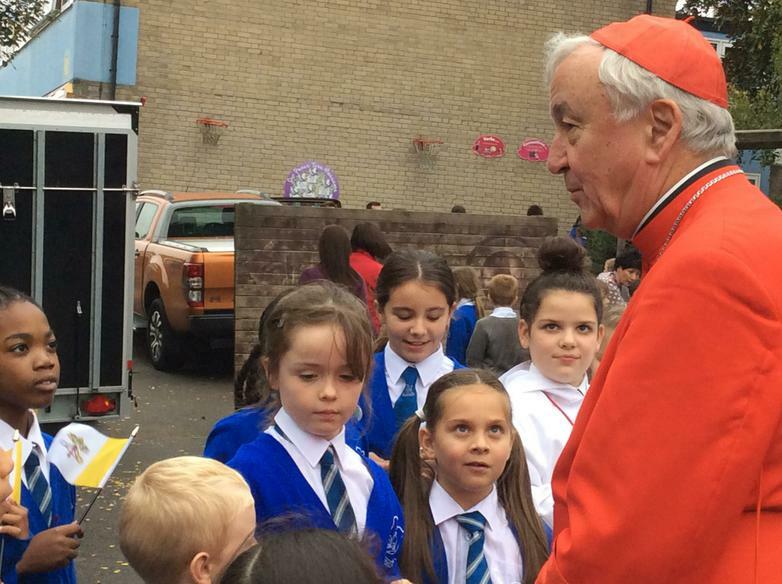 Today, we were very privileged to welcome His Eminence Cardinal Vincent Nichols, Cardinal Archbishop of Westminster, to our school as part of our 50th Anniversary celebrations. 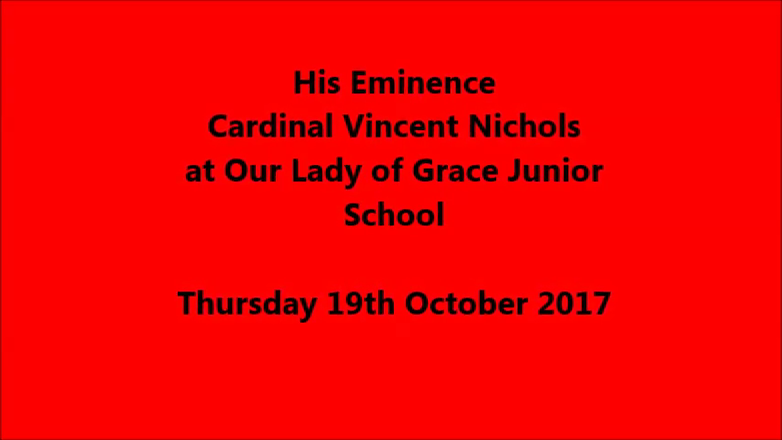 His Eminence arrived in time to be included in our whole school photo before chatting with our Mini Vinnies. 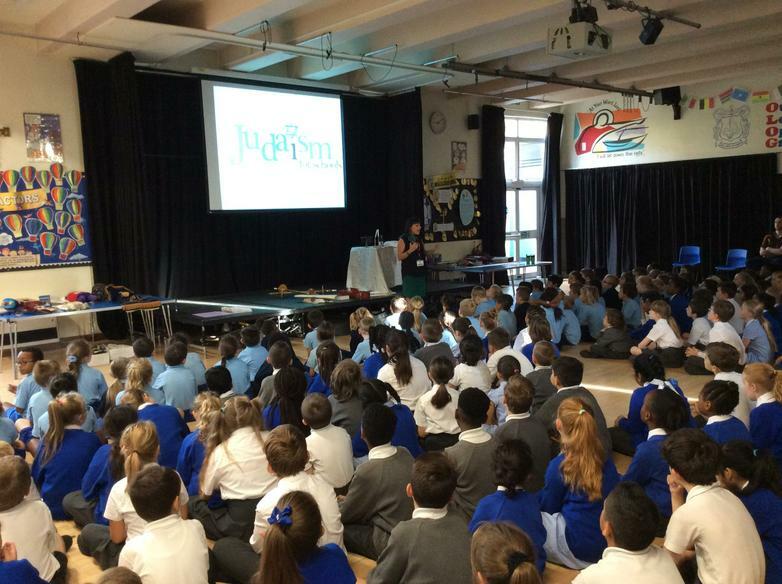 After that, they processed together into the hall to watch 6D's wonderful assembly which included a very special 'This is Your Life' for Cardinal Nichols. 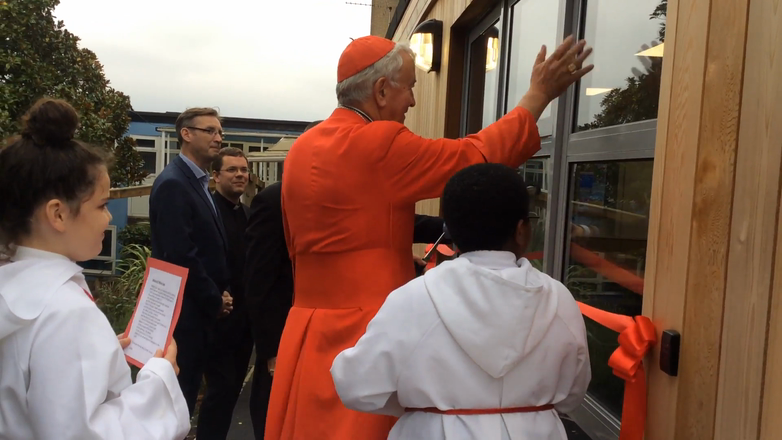 After that, parents and children were able to watch a live streaming of the Cardinal blessing Willow View (the name for our newly developed multipurpose learning area) from the hall. 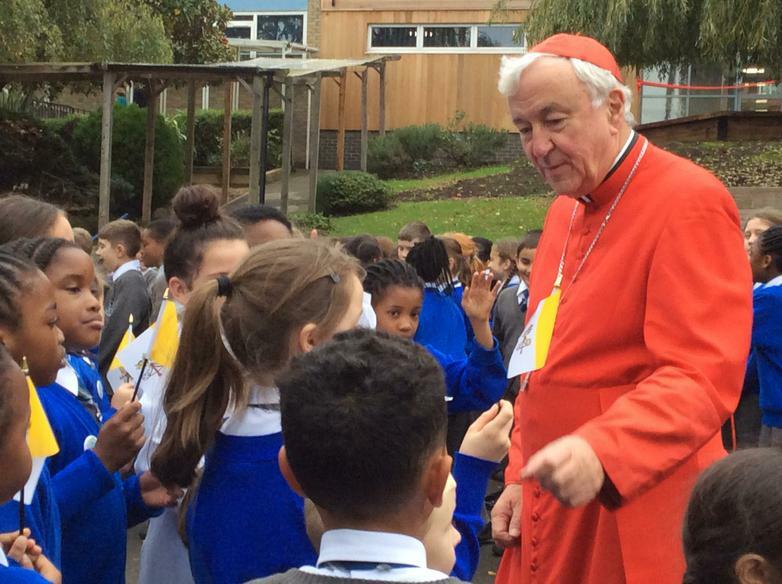 The Cardinal then spoke with the children about where the name of our school Our Lady of Grace originated. 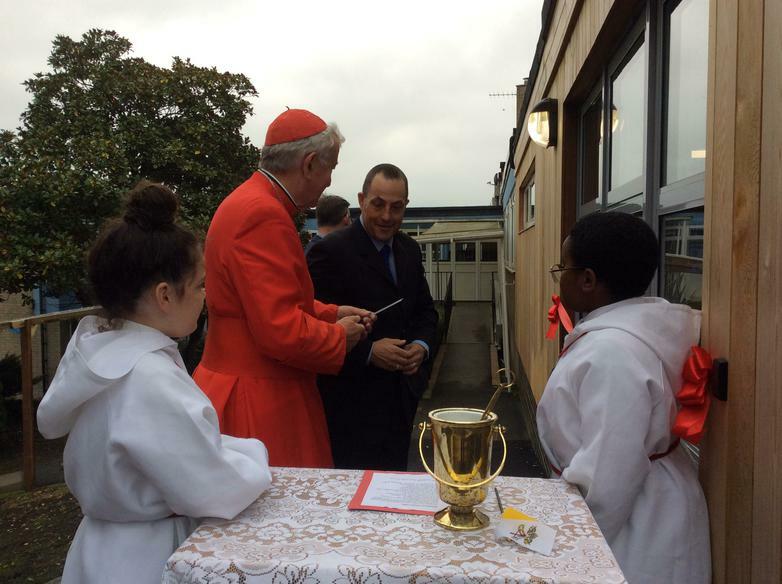 After the assembly, parents had a chance to have some refreshments and meet the Cardinal. Overall everyone had a lovely afternoon. 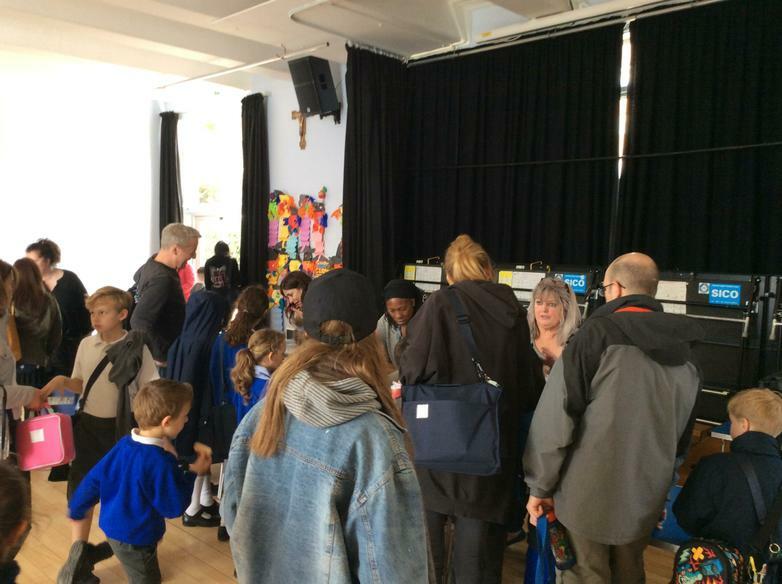 The children behaved beautifully and we thank all the parents and staff who were able to share this memorable occasion with us. There are more photos and some videos below. community through friendship and doing good works. 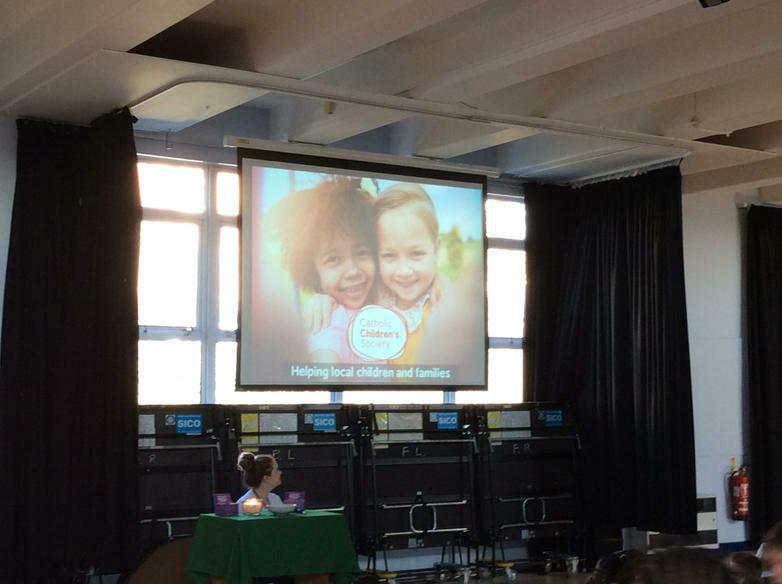 The children proudly received their badges and certificates in front of the whole school and some parents to mark the beginning of their important role. See below for pictures of this special occasion. 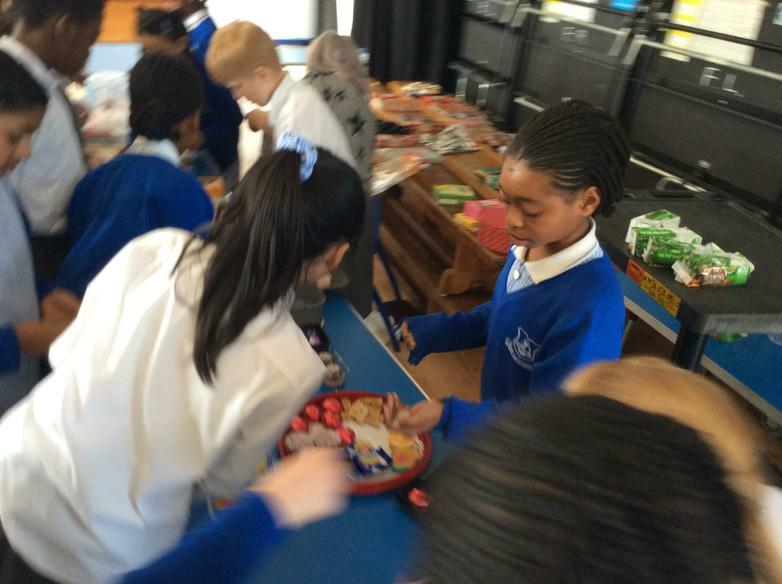 Thank you to everyone who was able to donate to another very successful Harvest collection at our school. Due to the generosity of the school community, we were able to collect over 700 items which have now been donated to Ashton Place. 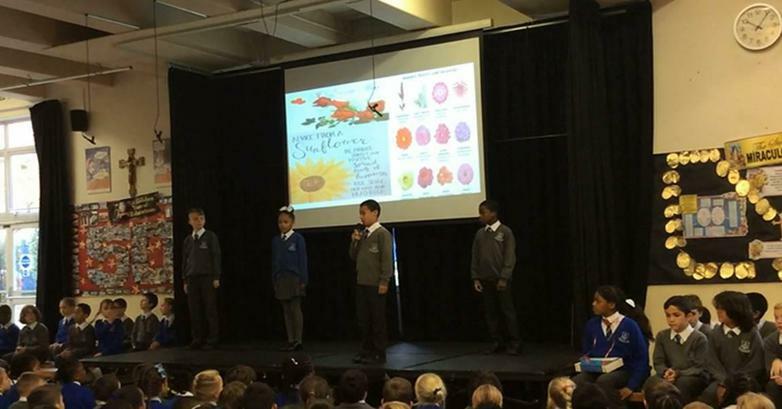 4M hosted our Harvest celebration with a fantastic assembly explaining its importance. 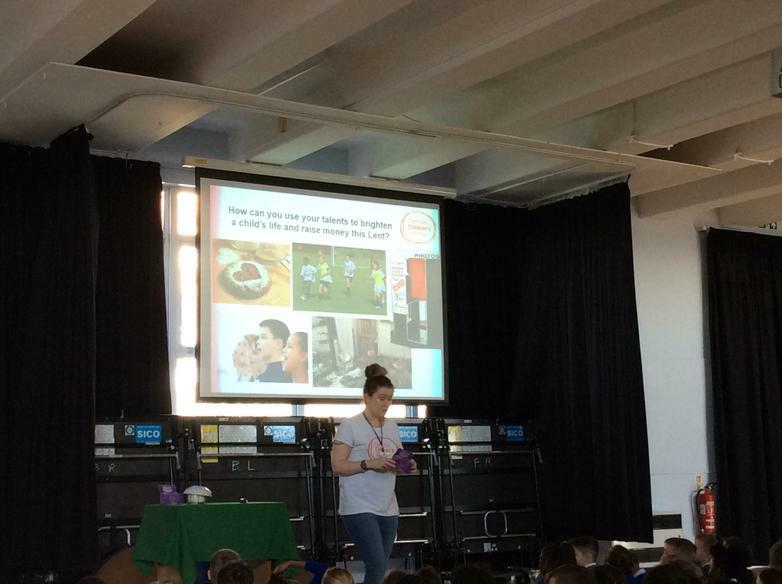 Thank you to Renee Gallagher, an employee at Ashton Place, who attended this assembly to speak to the children and accept the donation. Look below to see a picture of our Mini Vinnies and Renee proudly standing with the collection. Celebrating Our Lady of Grace Day with the Infant School. 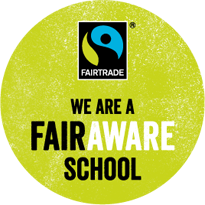 As a FairAware School we teach students where their food comes from, what is meant by ‘Fairness’ and evaluates how Fairtrade can work to address unfairness in supply chains. 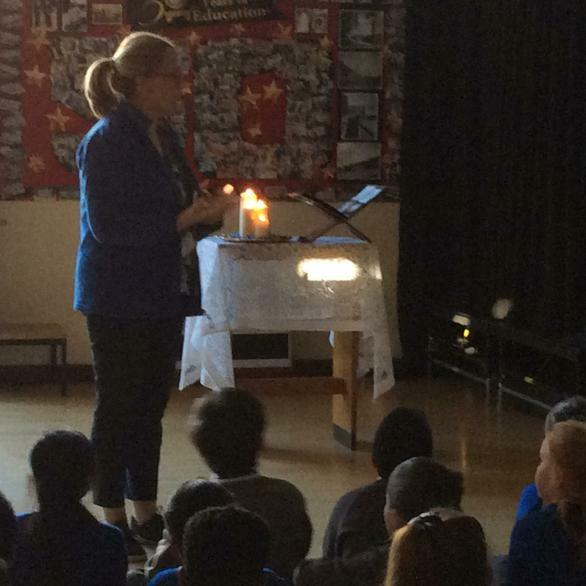 Mrs O’Mullane and I accompanied three of our Mini Vinnies: Zak Y3, Jaad Y4 and Soliyana Y5, to St Gregory’s College this week to pass on the Brent Year of Mercy candle. We were made very welcome and celebrated a liturgy in the school chapel with some past OLOG pupils and other St Gregory’s students. 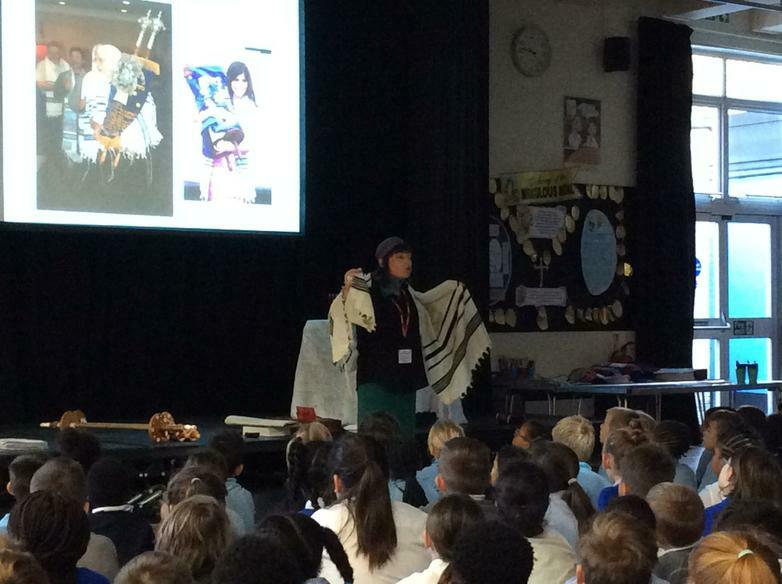 The children have really enjoyed the work they have done this week on Judaism. 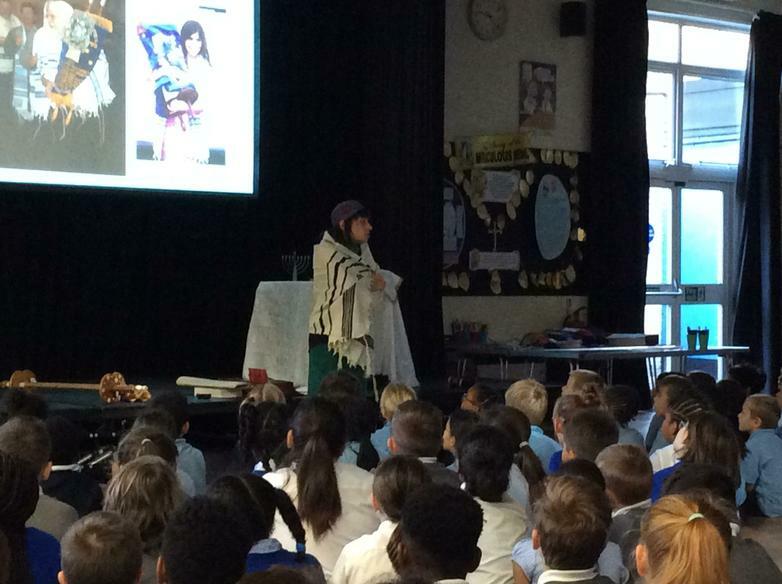 Ruth joined us from ’Judaism for Schools’, and led a whole school assembly on Wednesday morning. 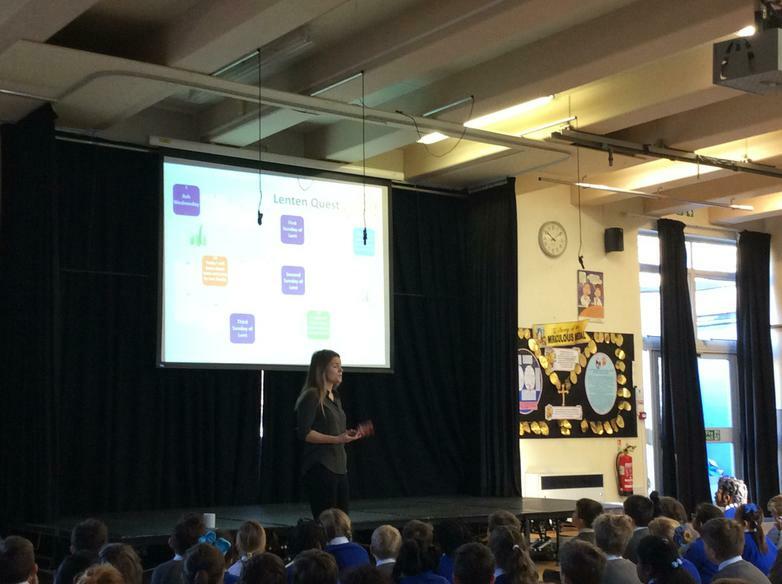 She then worked with each year group over Wednesday and Thursday in the hall. 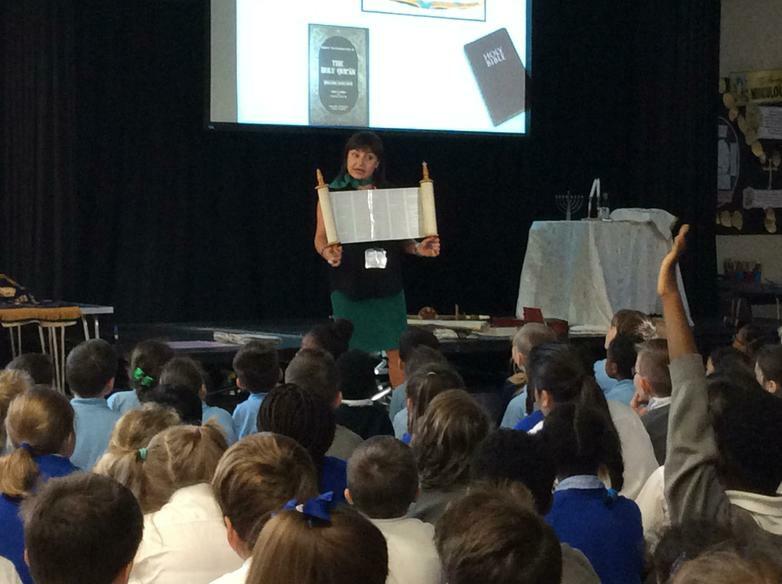 As well as learning about Shabbat, the Torah and Bar/Bat Mitzvah, the children were given the opportunity to handle scrolls, religious clothing and artefacts. 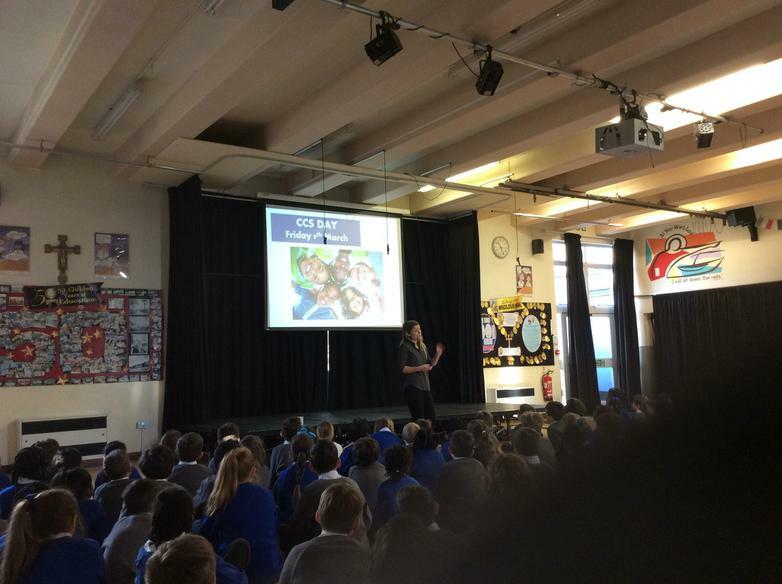 They have learnt new things about one of the major world religions which will help them understand how everyone in the world is different and unique. 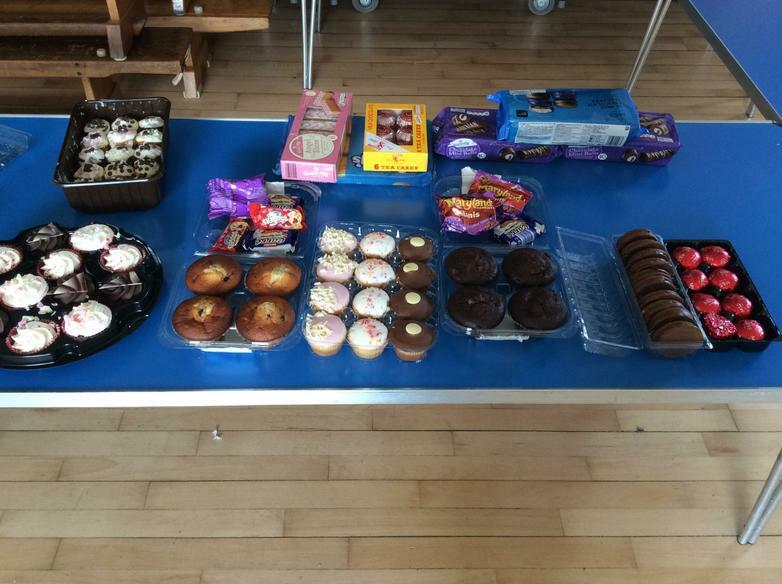 The Lenten Prayer Group was on Wednesdays during Lent and has been a huge success. 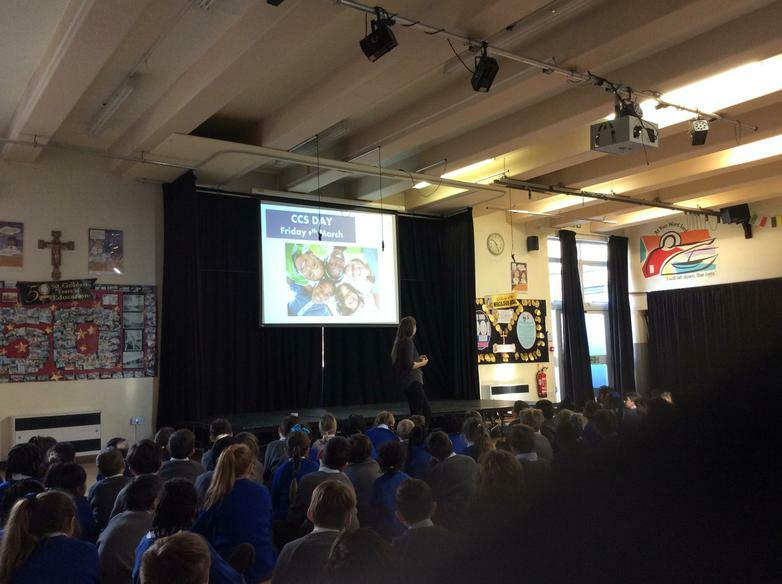 All pupils were welcome and twenty attended most weeks. We focused on Stations of the Cross this year. A favourite activity was Stations of the Cross Bingo. 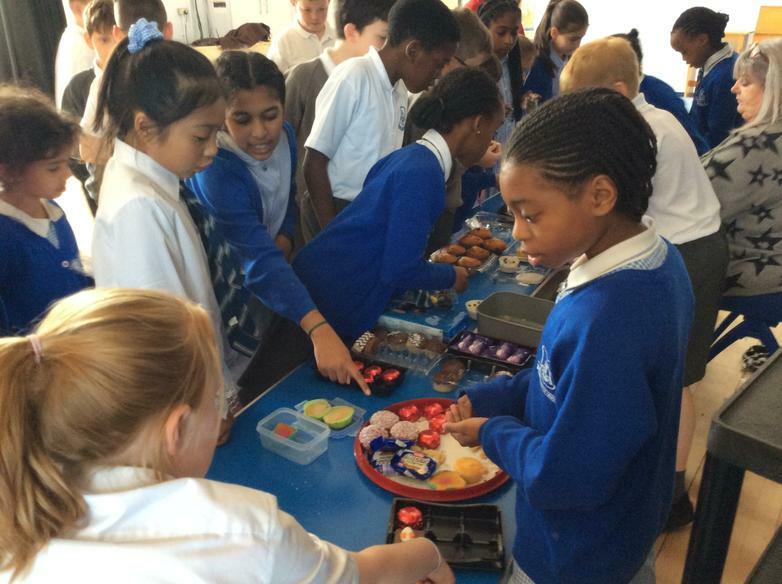 Children also enjoyed making their own Last Supper scenes. Look out for The Rosary Prayer Club in Mary's month of May. 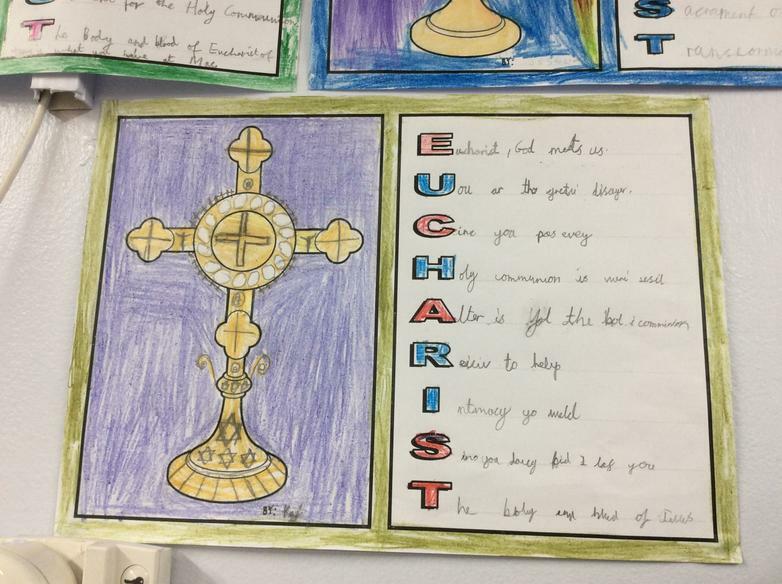 Our Year 4 children wrote about what the Eucharist means to them and how they felt receiving the Holy Communion. 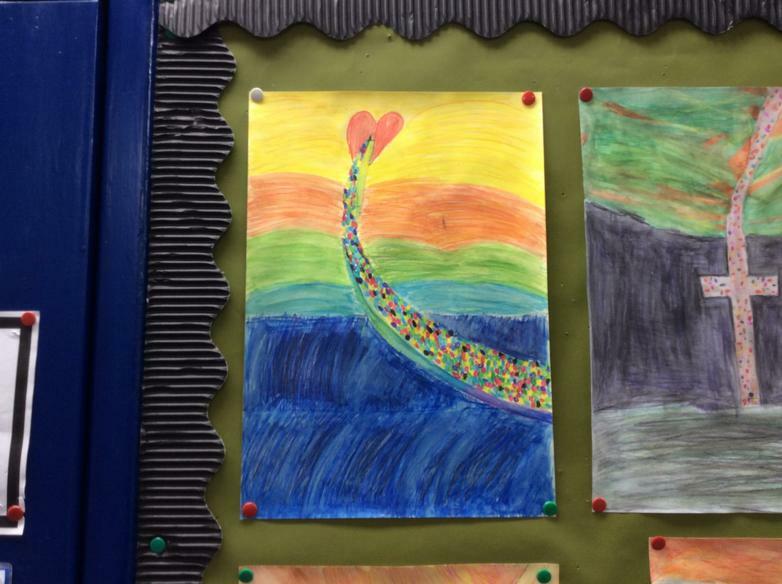 In this term's work, pupils are beginning their study by examining one or both of the stories of creation found in Genesis 1 and 2. 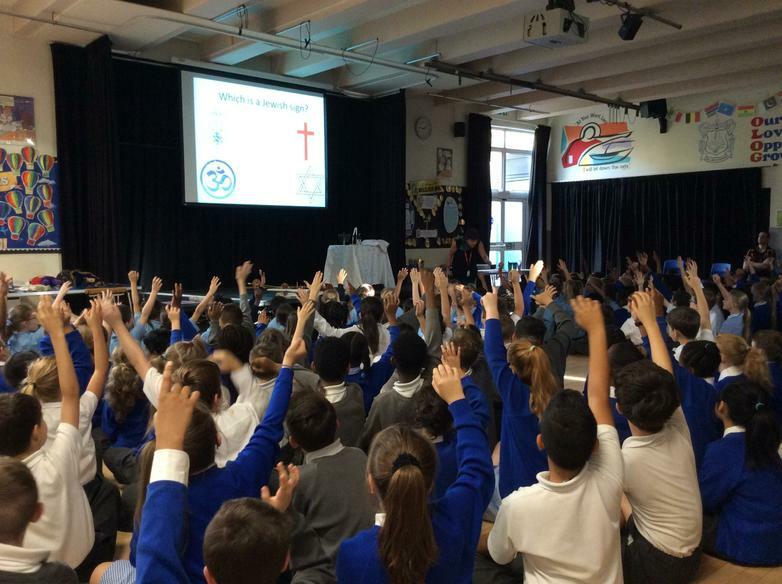 In learning about and then praying the Psalms, pupils are learning how the Church praises God in creation.